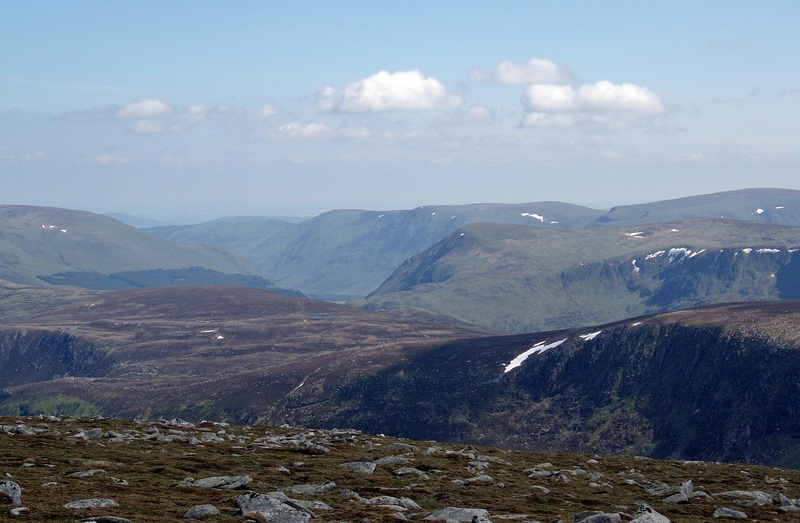 When I went back to work after the TGO Challenge my left knee was still sore and I kept limping all week. I should have probably given my knee some rest on my days off, but the weather forecast was just perfect and I couldn’t wait to get out walking again. So I decided to give it a go, after all I could always abandon the walk if it got worse, and I also took my knee support with me, just in case. 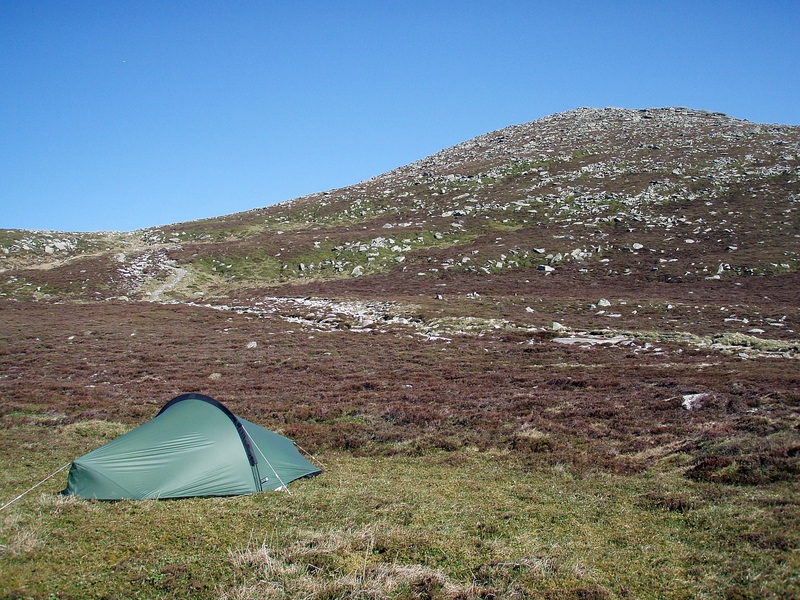 I finished night shift at 07:00, and after sleeping a few hours, as well as having lunch, a shower and packing my rucksack, I was finally on my way at 16:45 (including a detour to Tesco as I had forgotten to buy CupASoup when I did some food shopping during my last tea break). Two hours later I arrived at the car park at Spittal of Glenmuick and wondered how to pay the fee for the next two days as the day tickets are only valid 24 hours. In the end I just bought two parking tickets and wrote the dates on them. 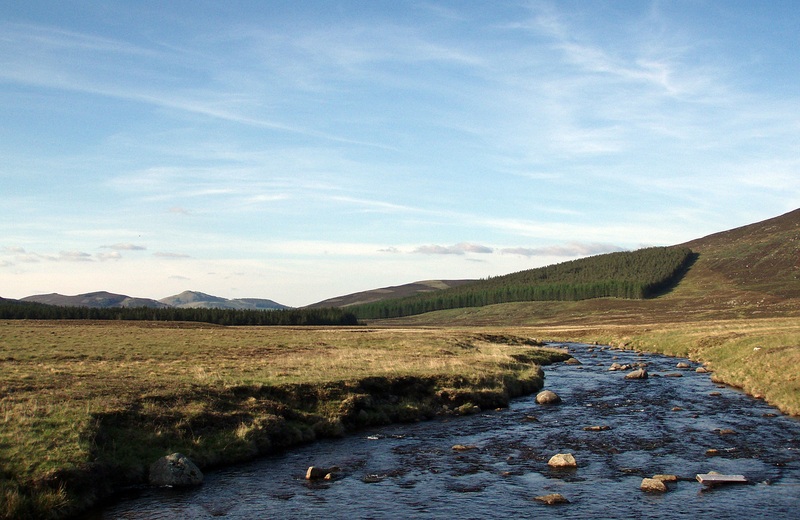 River Muick. Signpost at Allt-na-giubhsaich. 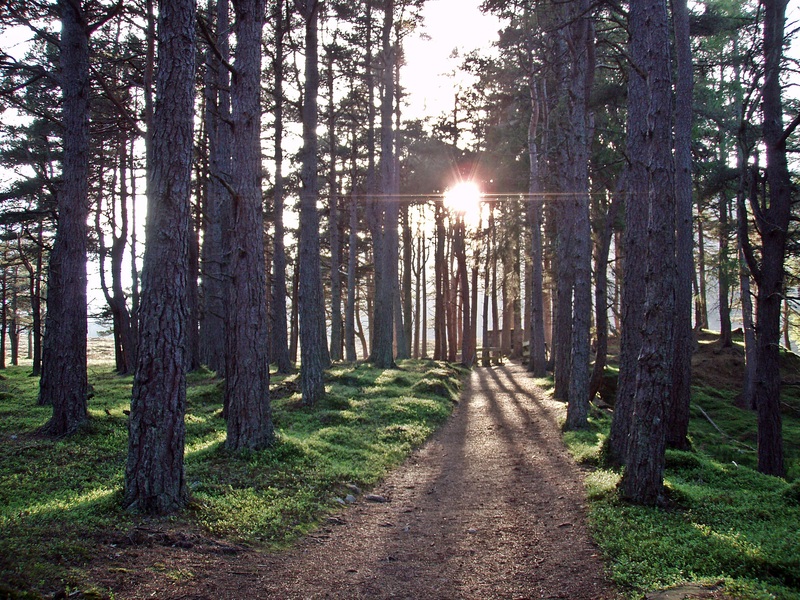 Evening sun shining through the trees. 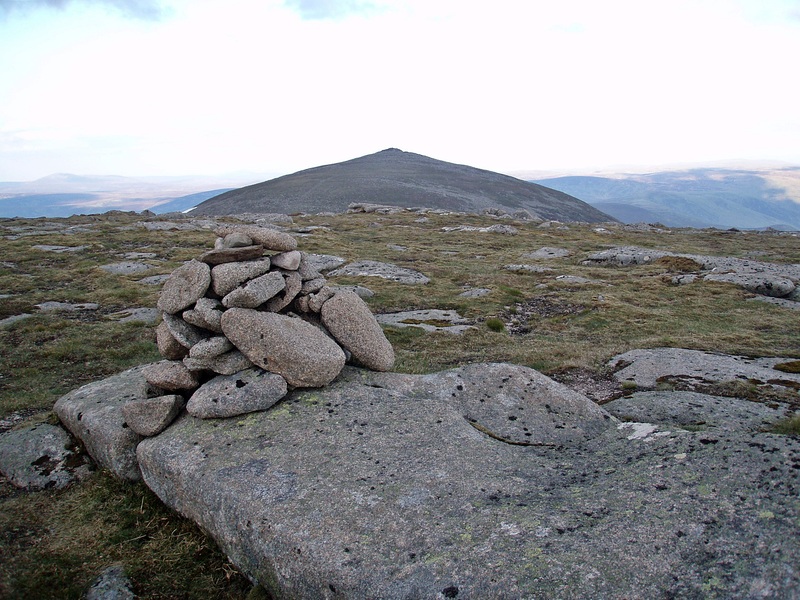 Cuidhe Cròm and Meikle Pap. 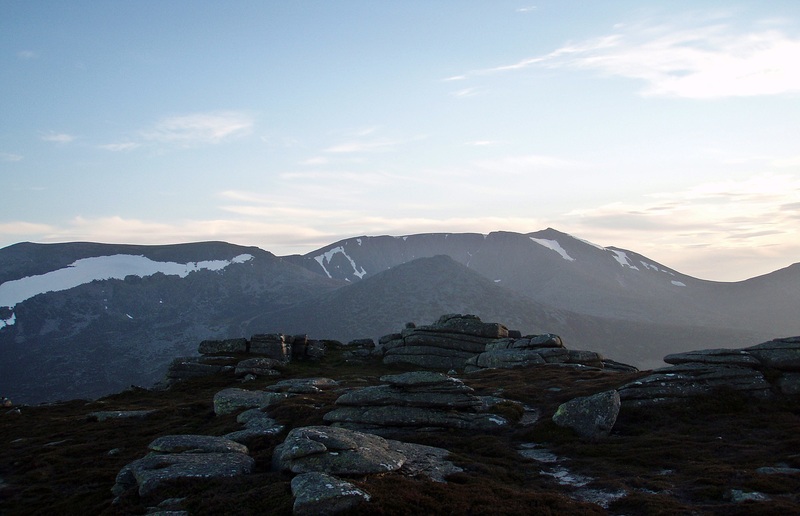 I left my rucksack at the path junction to Lochnagar and made the quick detour to Conachraig. 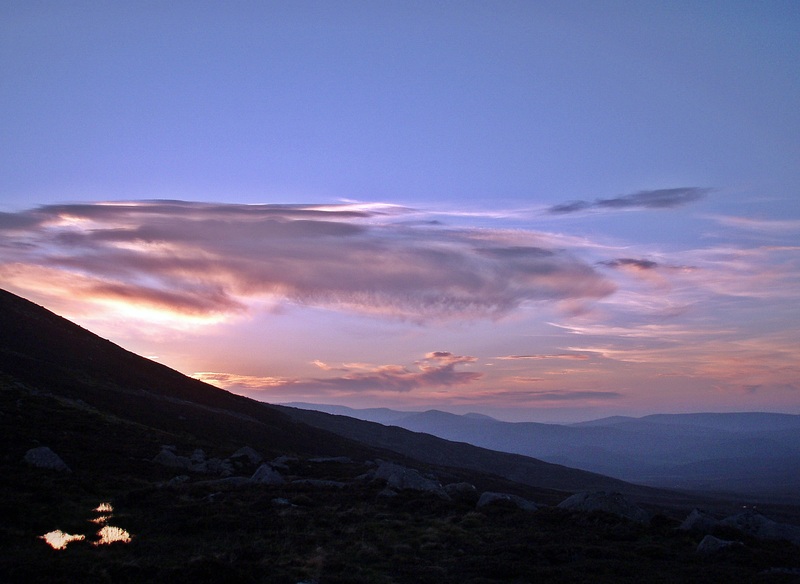 I reached the summit 20 minutes later, it was a little colder at the top but it was still a nice evening. 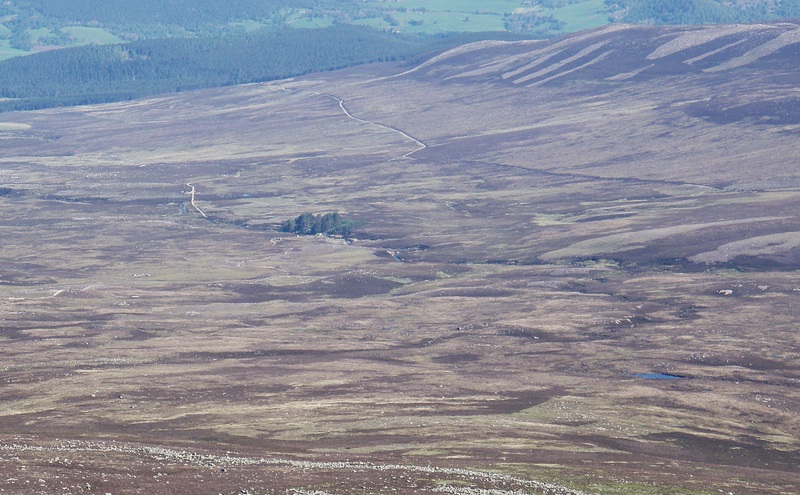 Lochnagar from the summit of Conachcraig. 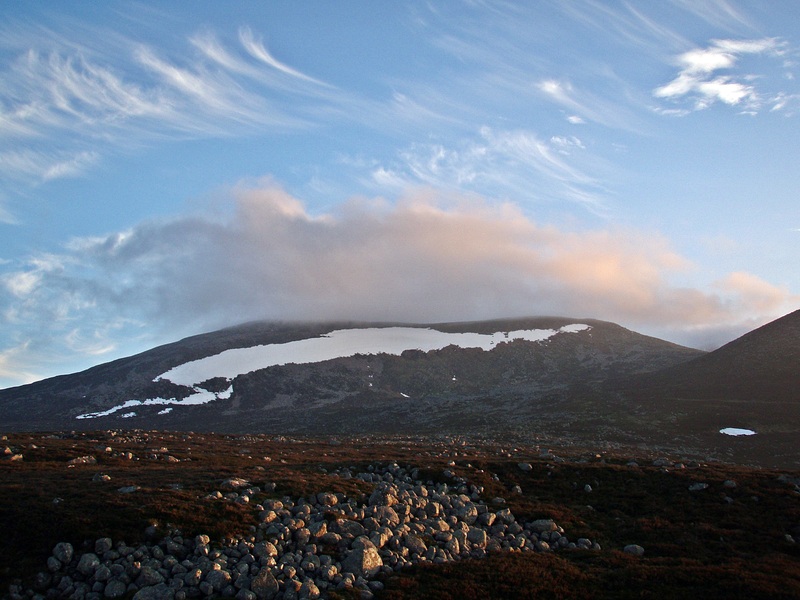 Interesting clouds over Cuidhe Cròm. 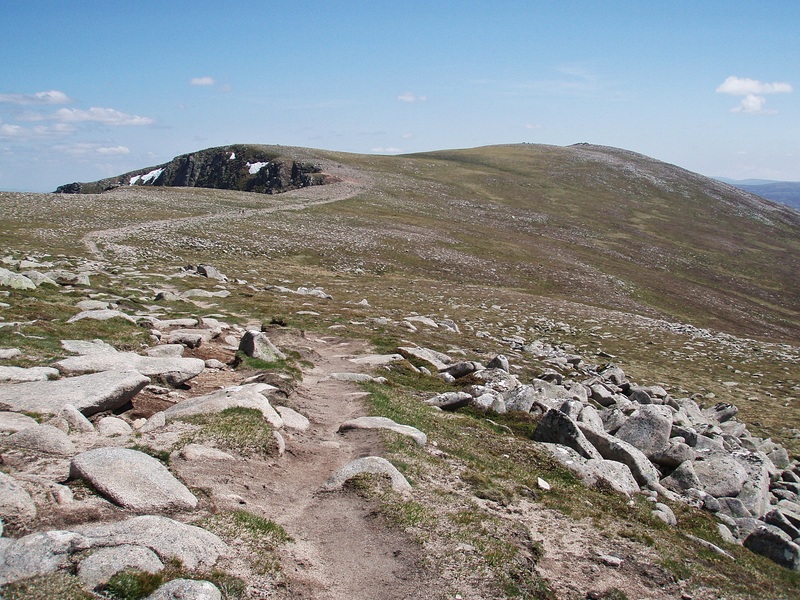 I collected my rucksack and followed the path to Lochnagar. It was time to look for a camp site but I couldn’t find any water, all the small streams crossing the path were dried out. 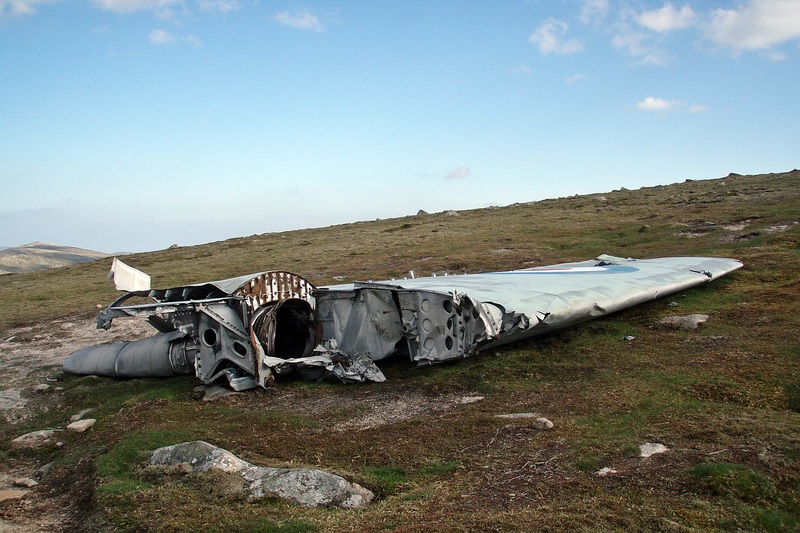 When I left the path to have a look at the memorial to Bill Stuart, I noticed an area of flat mossy ground a little higher up. 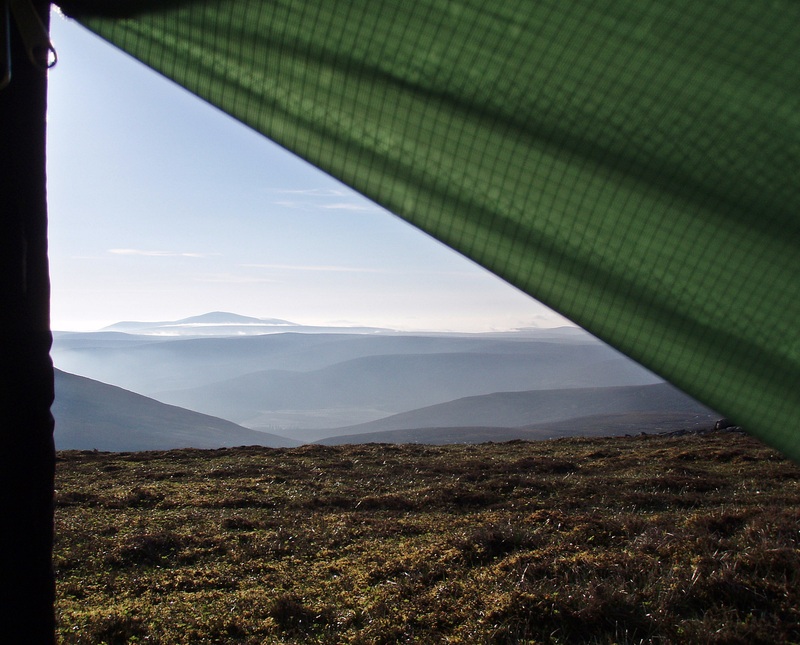 I woke up to another wonderful morning and a great view of Mount Keen from my tent. 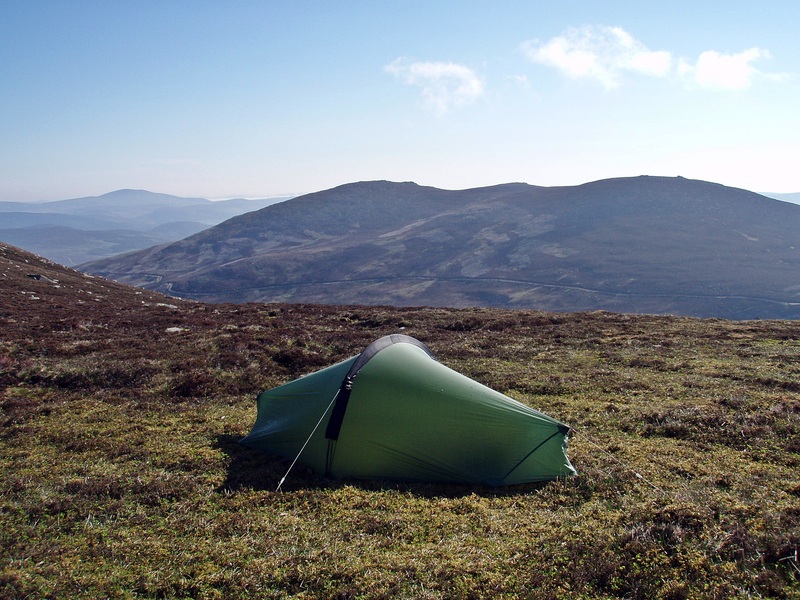 The night had been so cold that my tent and the ground were covered in frost, but it all melted away quickly in the morning sun. 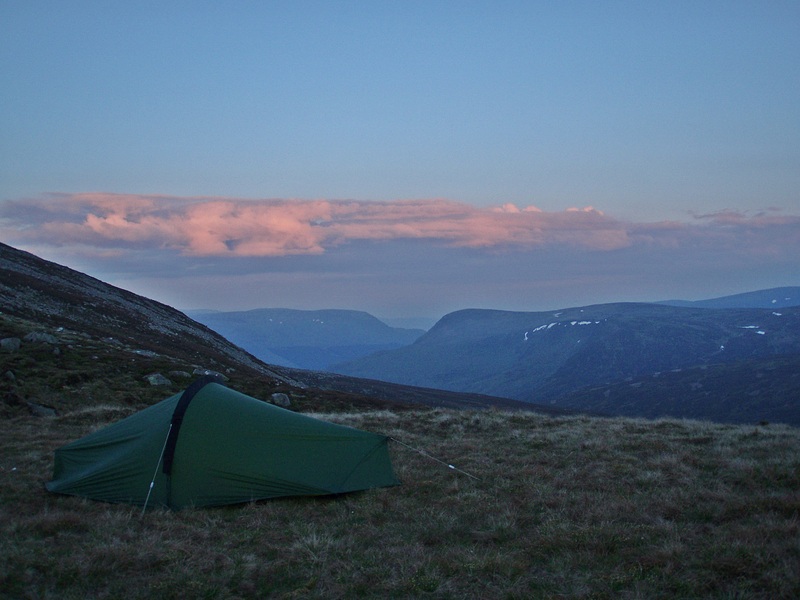 In fact, it soon became so warm inside that I had to sit outside the tent to do the packing. 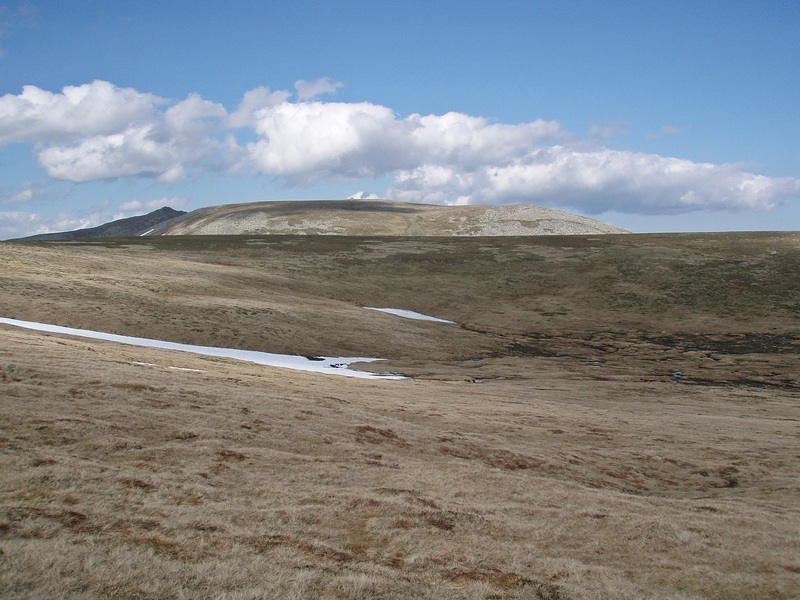 Camp below Meikle Pap. The first day walker passed at 08:00 (! ), and I was ready to go an hour later. 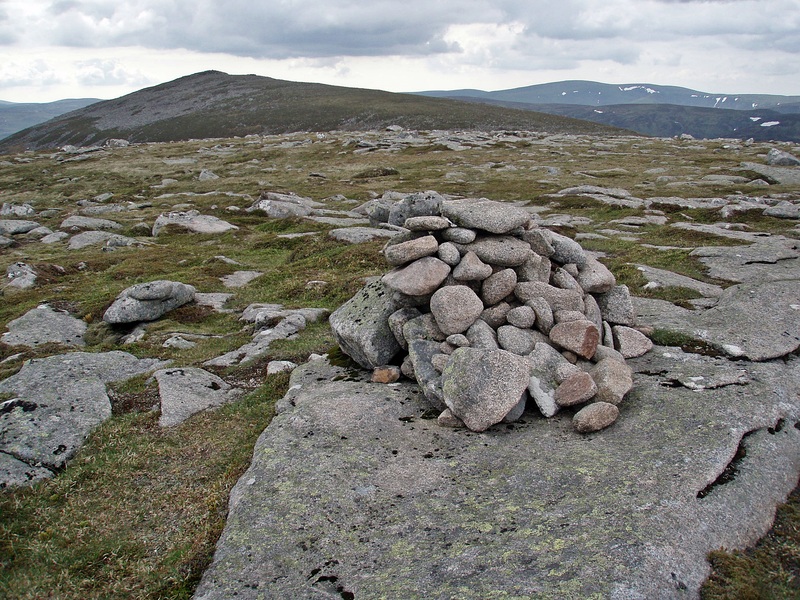 Conachcraig. 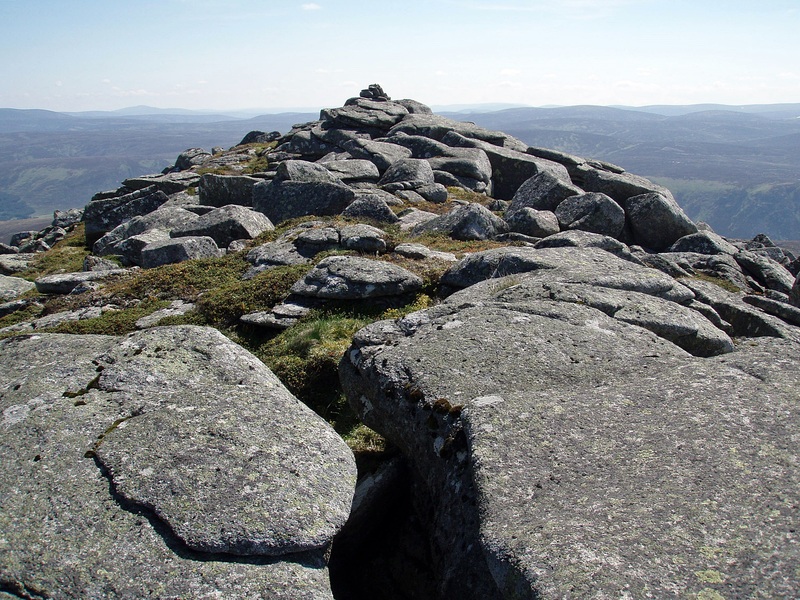 I left my rucksack behind a boulder on the bealach and climbed to the rocky summit of Meikle Pap, the first Munro Top of the day. 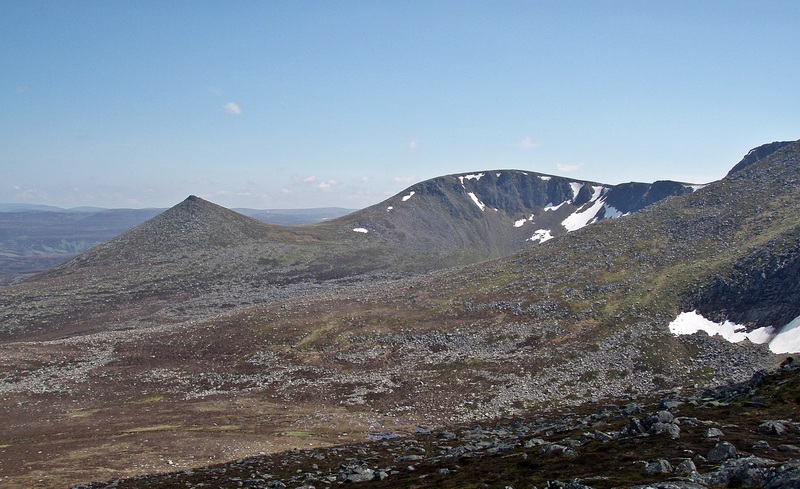 Meall Coire na Saobhaidhe, one of Lochnagar’s Tops. 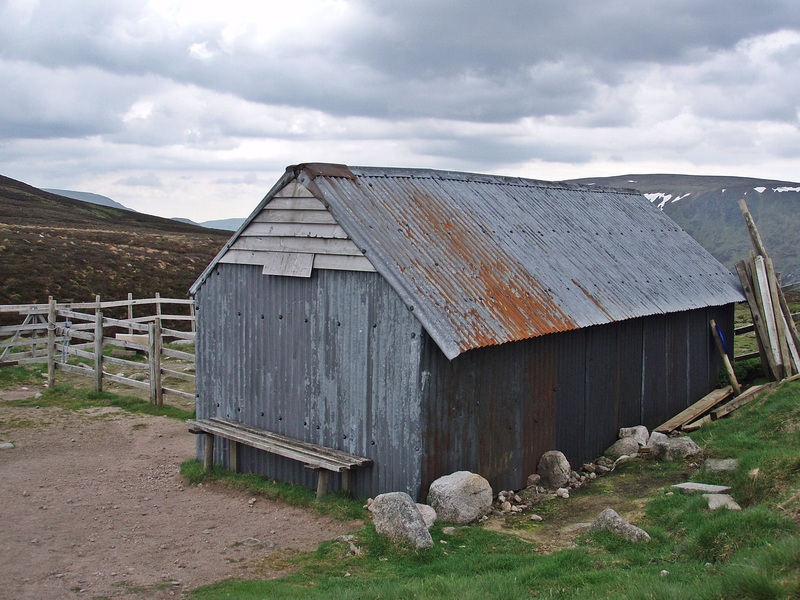 Gelder Shiel, a bothy that I’ve been wanting to visit for a long time – maybe on a future TGO Challenge? 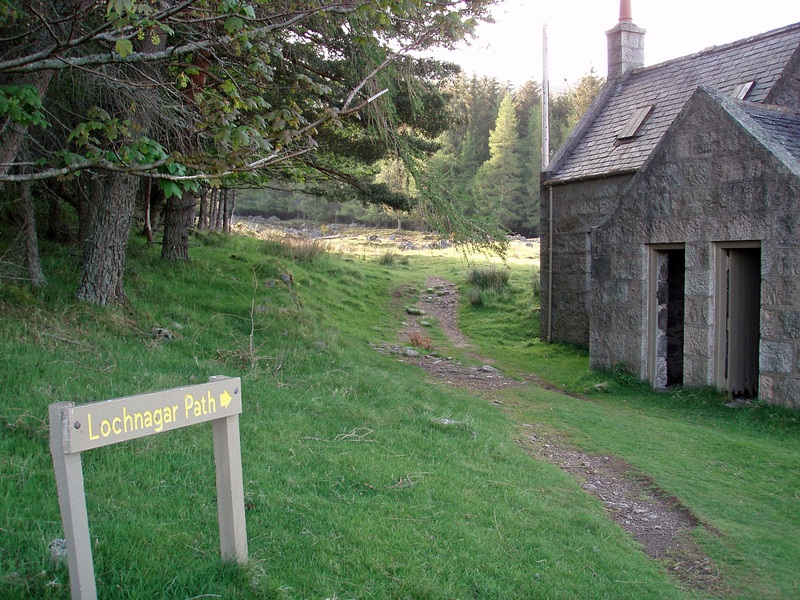 Conachcraig. 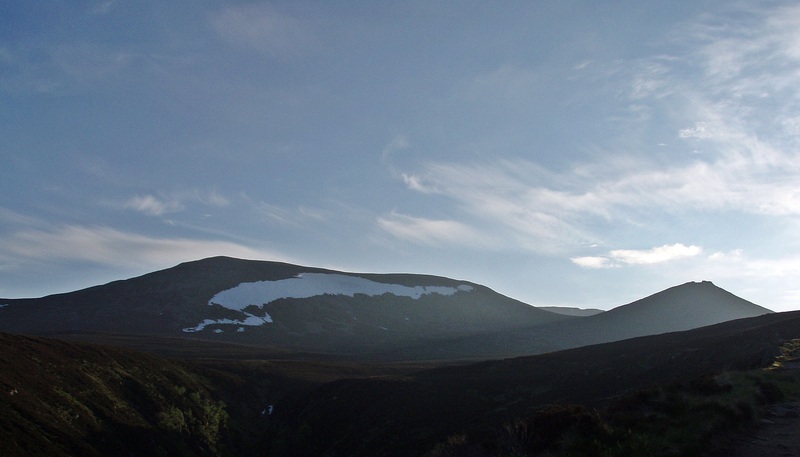 Meikle Pap is regarded as a great viewpoint for the Corrie of Lochnagar – and it certainly is! 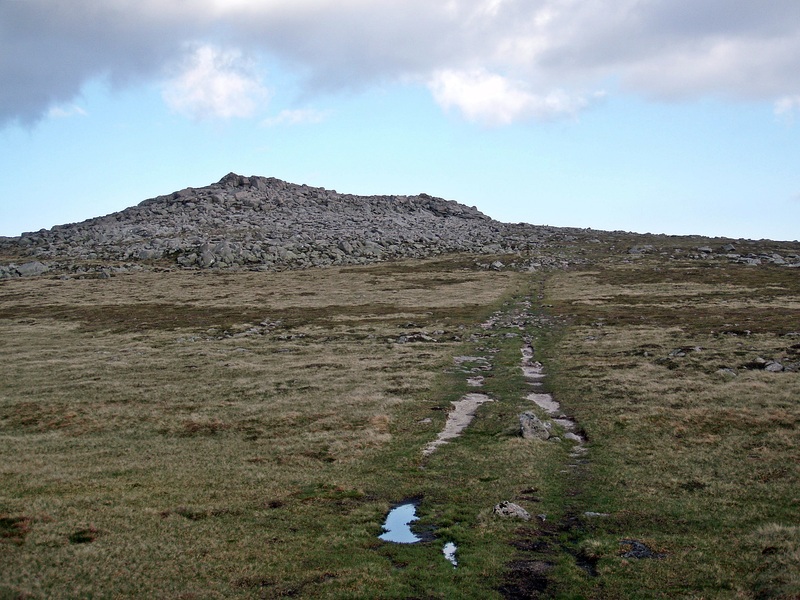 “The Ladder” route up to the plateau. 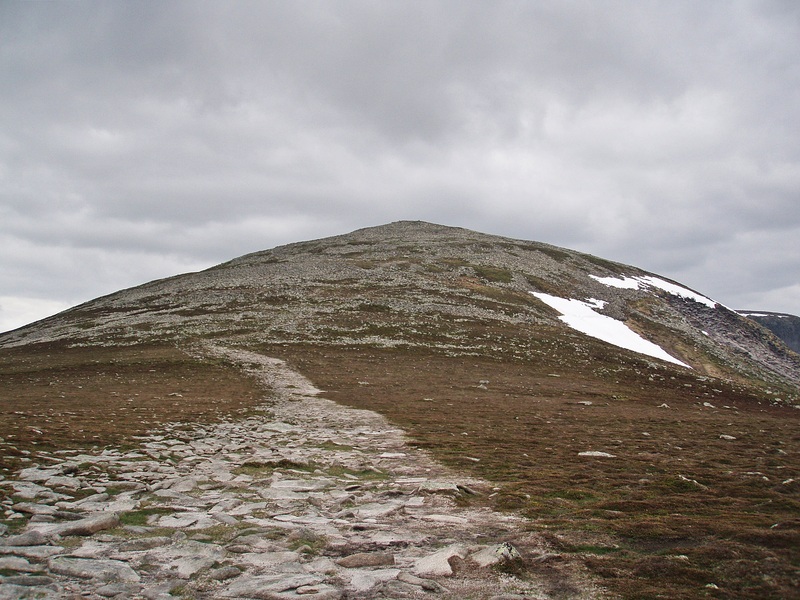 I returned to the bealach, collected my rucksack and climbed up the well-constructed path which really seems more like a staircase than a ladder! 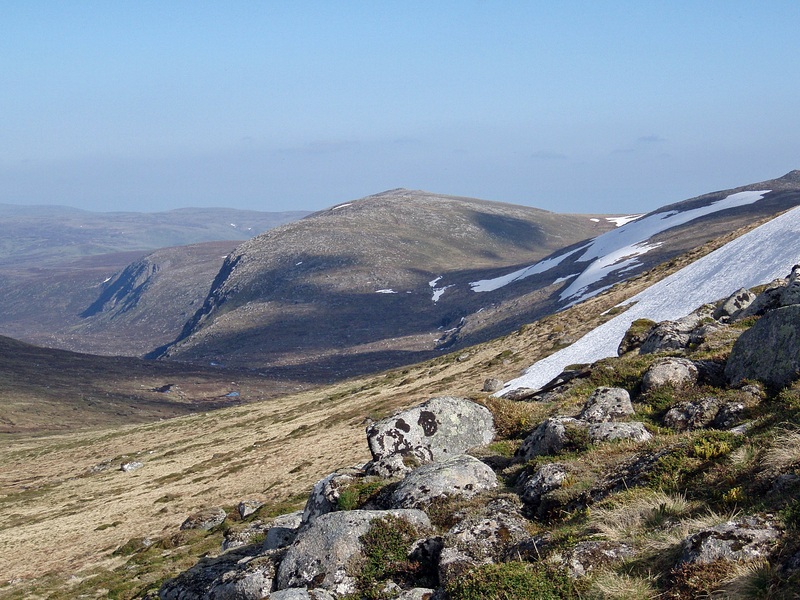 The steep ascent felt like hard work in the hot sun, but soon I could look down on Meikle Pap. 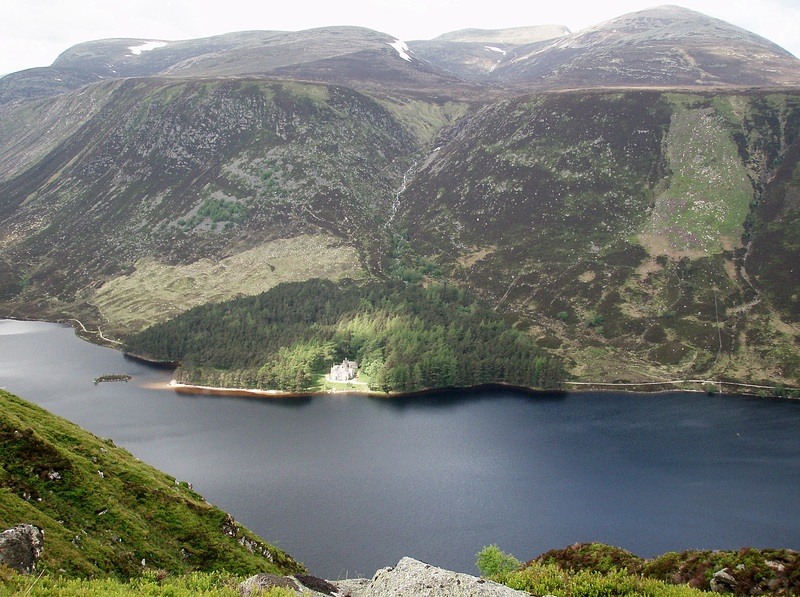 Cliffs and buttresses above the loch. 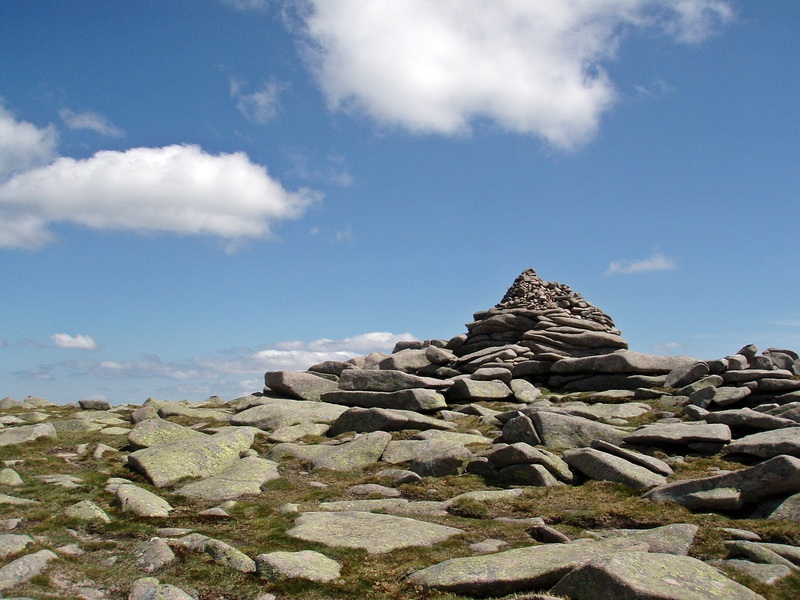 When I reached the grassy plateau, I thought I could quickly bag the next two Tops. 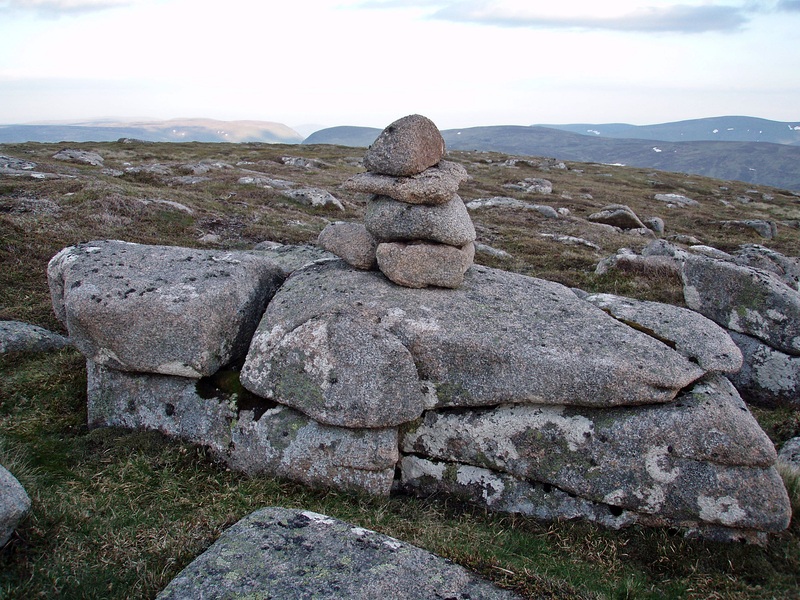 The first one, Cuidhe Cròm, was easy indeed. 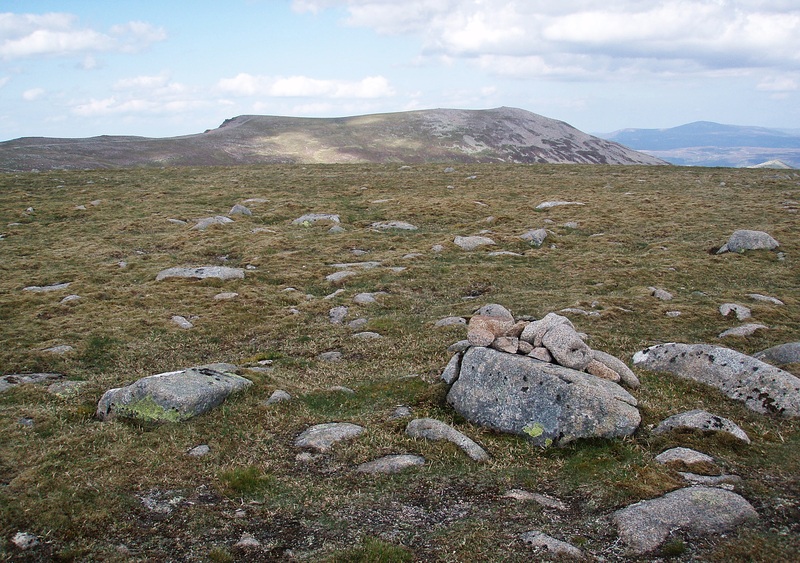 But on the way to Little Pap there is an obstacle… a large boulder field. 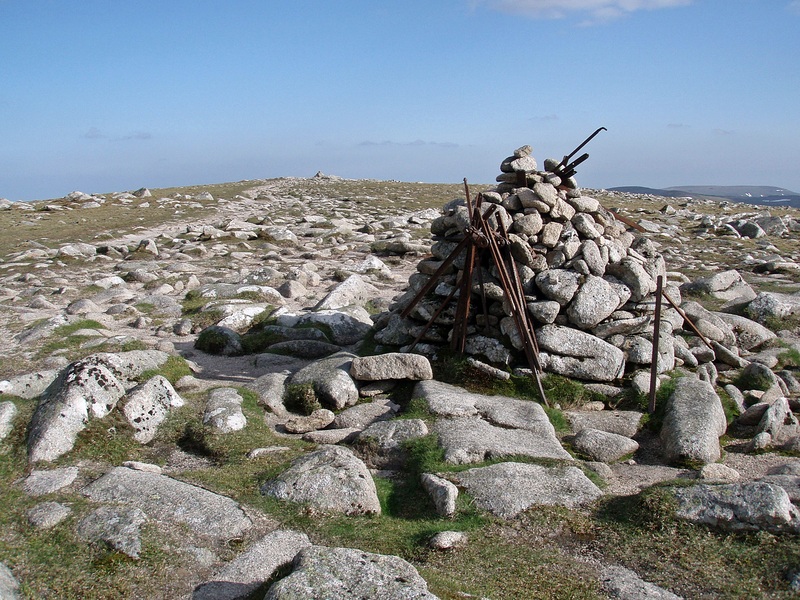 Again, I left my heavy rucksack behind, but it still took me a long time to reach Little Pap. 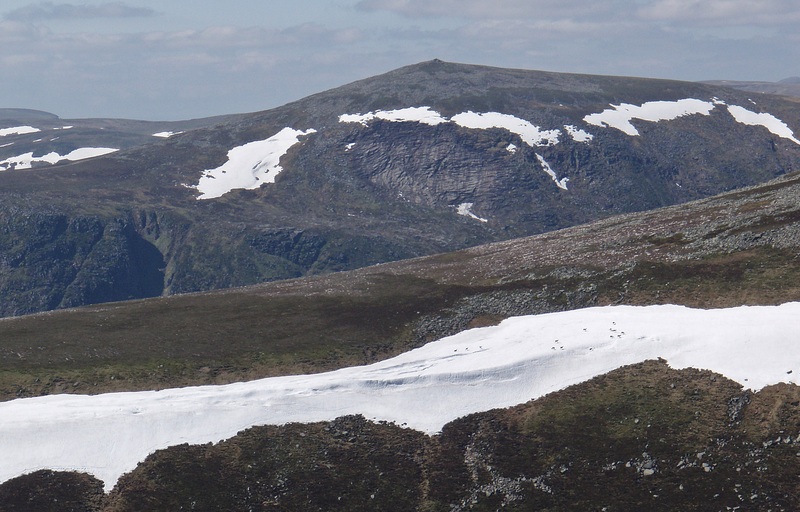 But it was worth it for the views – Broad Cairn in the distance and deer on the snow patches on the slopes of Creag a’ Ghlas-uillt. Spittal of Glenmuick. 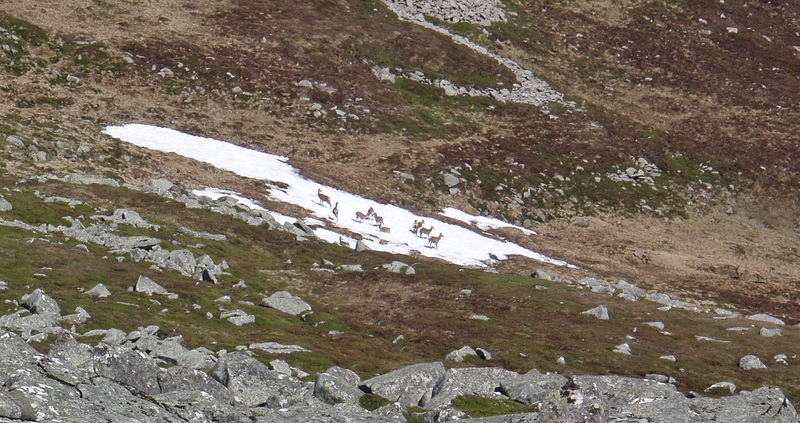 Deer cooling their feet in a snow patch… I would have liked to do the same! 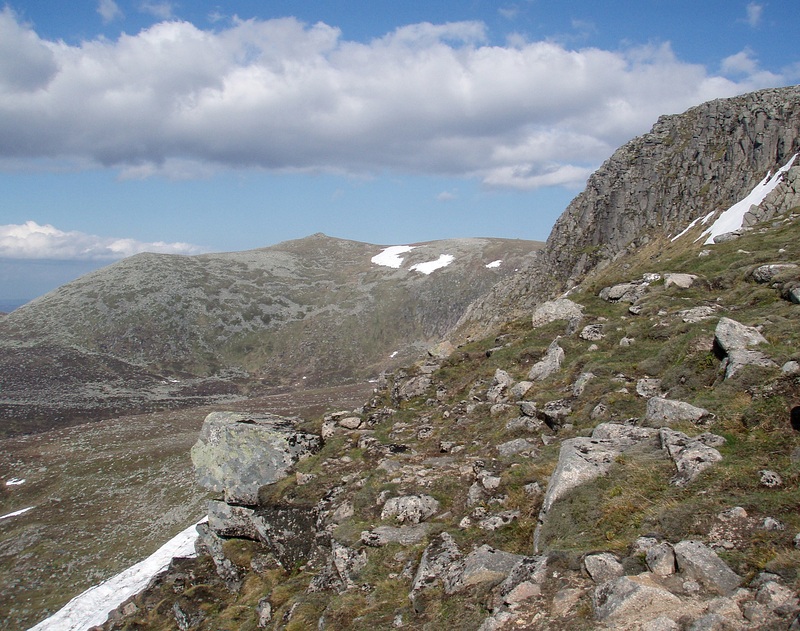 Climbing up the boulder field was a bit easier, and soon I was back on the plateau and on my way to Lochnagar. 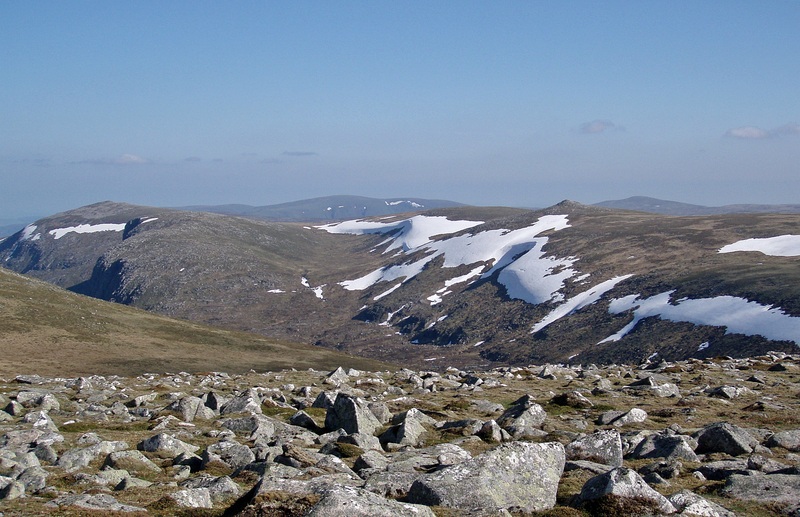 Looking back to Cuidhe Cròm. 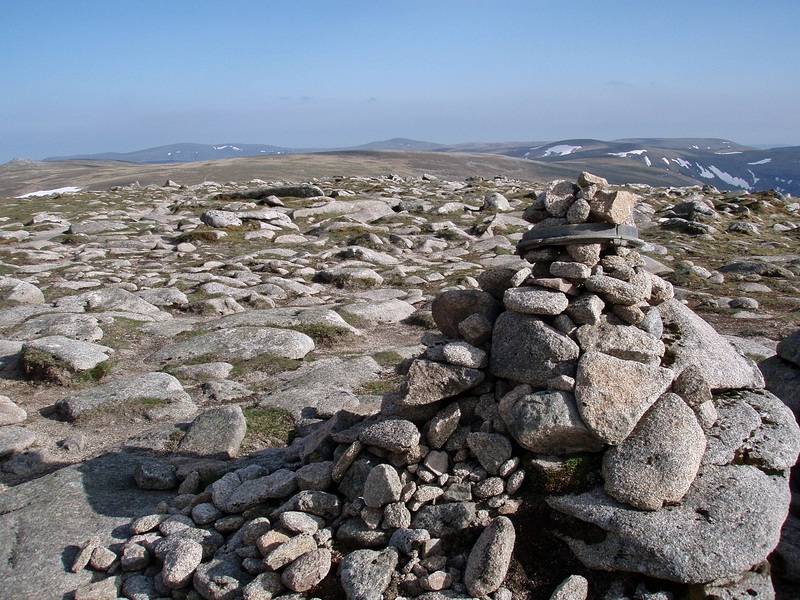 Cac Carn Mòr. 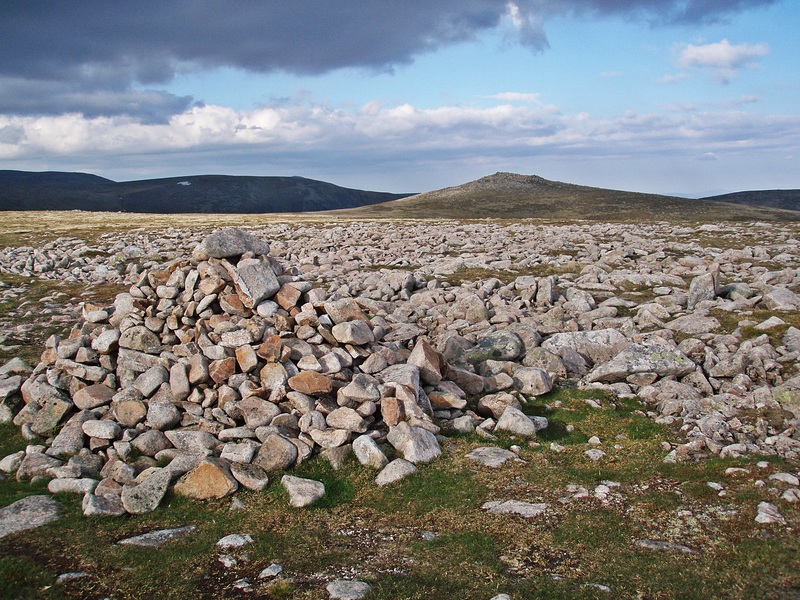 The busy summit of Lochnagar, Cac Carn Beag. 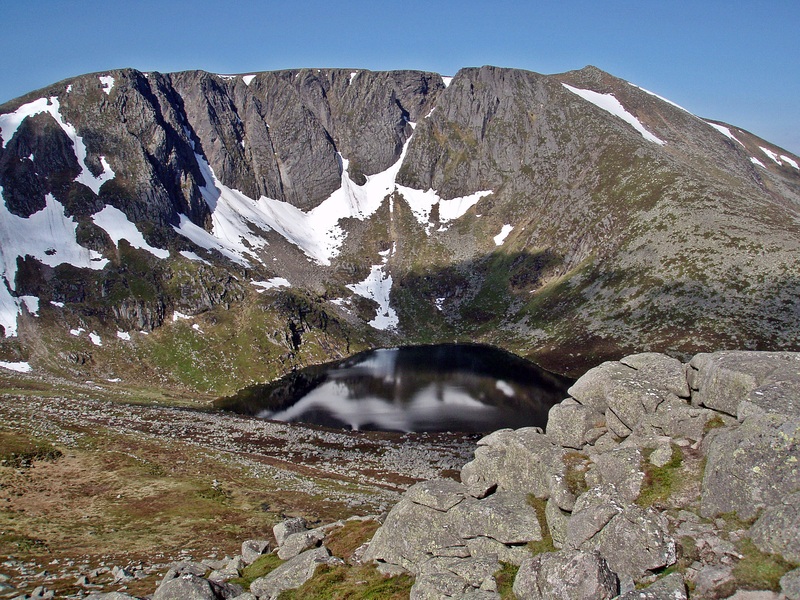 Coire Lochan nan Eun. 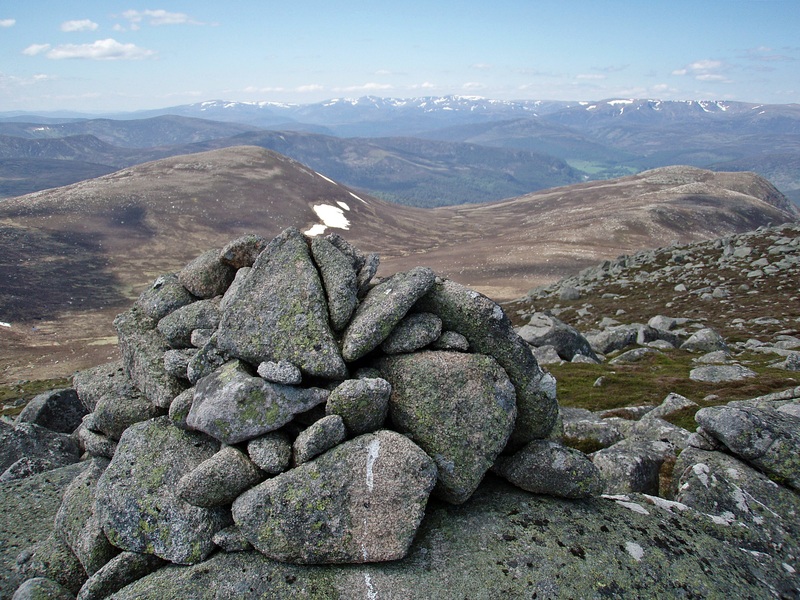 From the summit Meikle Pap looks tiny in comparison. 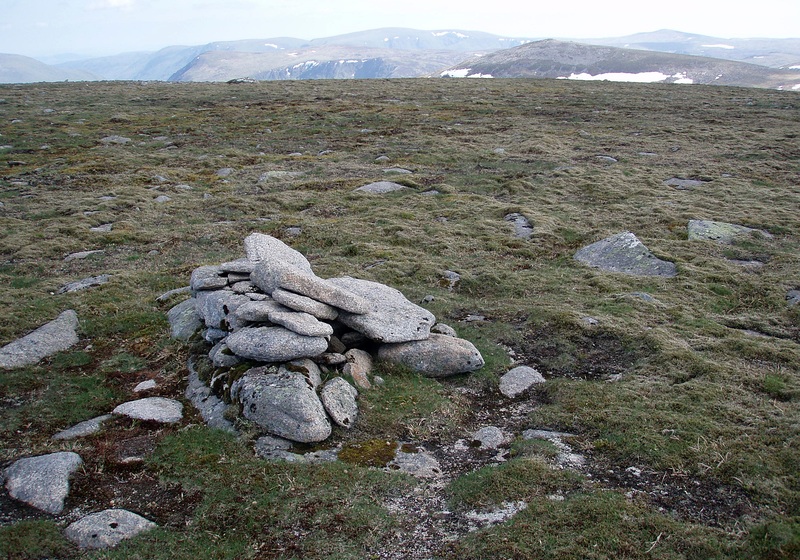 I descended from the summit in a NW direction and found a place to hide my bag, then I descended N to the boggy bealach before Meall Coire na Saobhaidhe. This was easier than it looked from above as there were traces of a path. 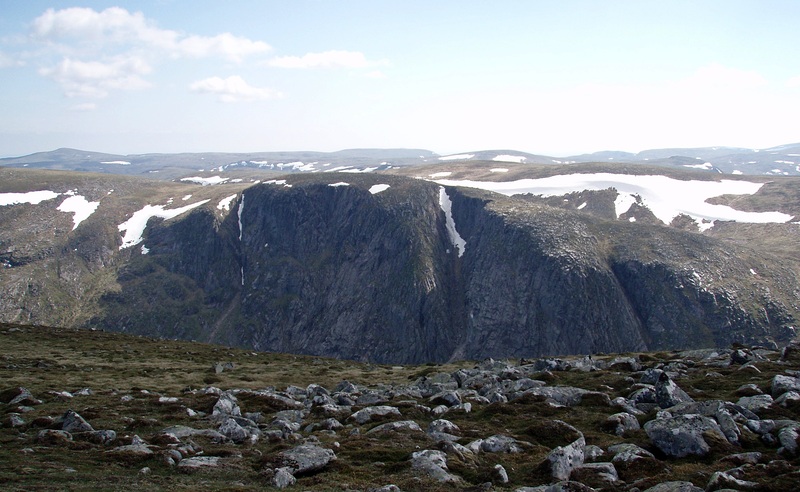 Meikle Pap and the Corrie of Lochnagar. 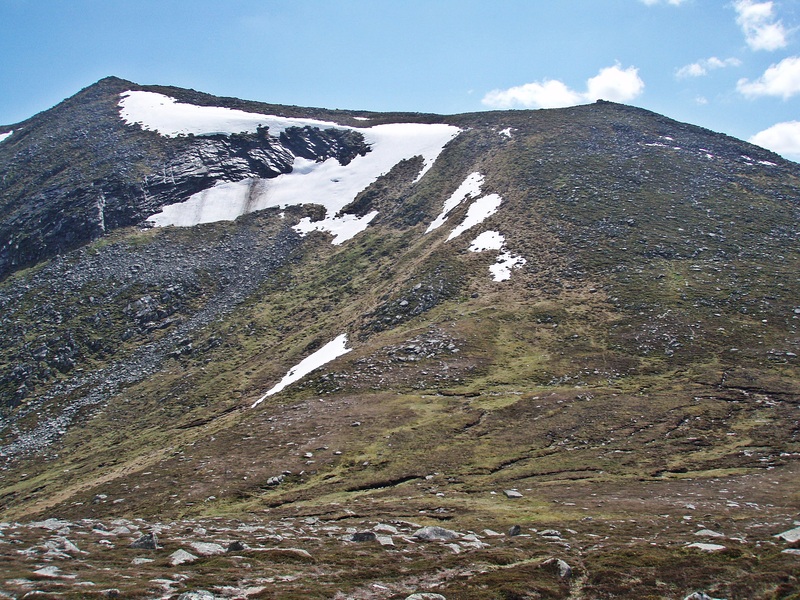 I was pleasantly surprised to find a path leading around the E flank of Meall Coire na Saobhaidhe and up to its summit. 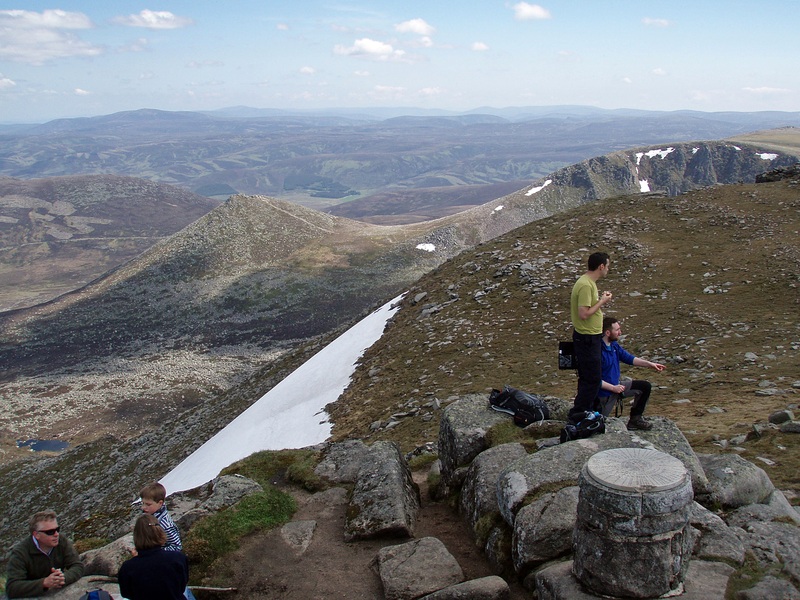 On the way back I got a good view of the steep cliffs below Lochnagar’s summit. 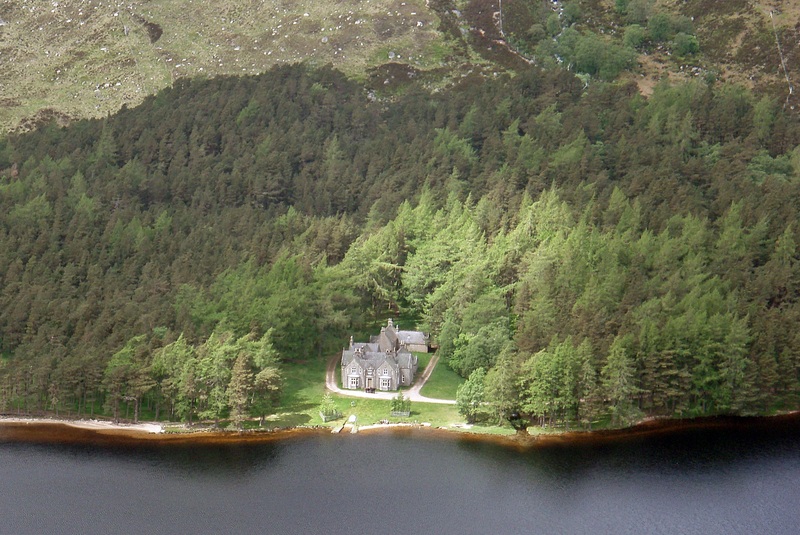 Loch nan Eun. 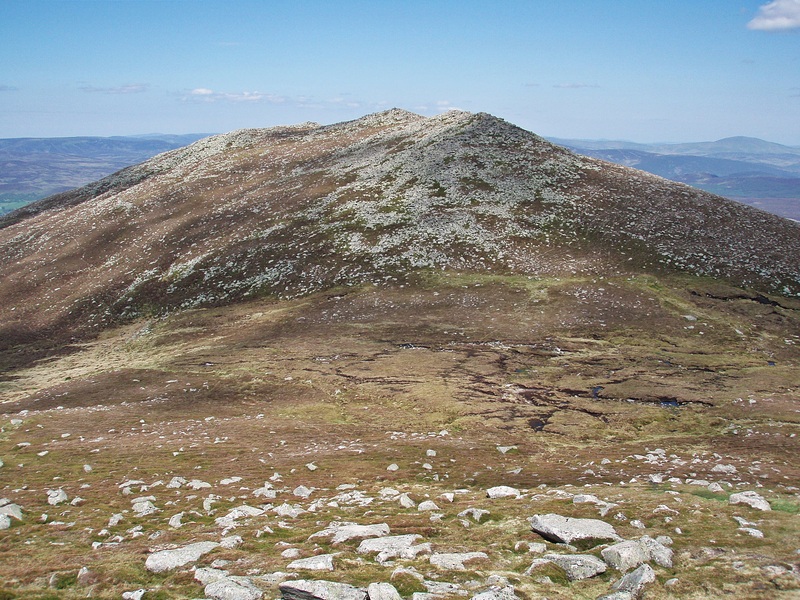 Before I headed over to the second Munro I made a quick detour to the two Munro Tops Creag a’ Ghlas-uillt and Eagles Rock. Both are really just grassy lumps and easily bagged on the way. 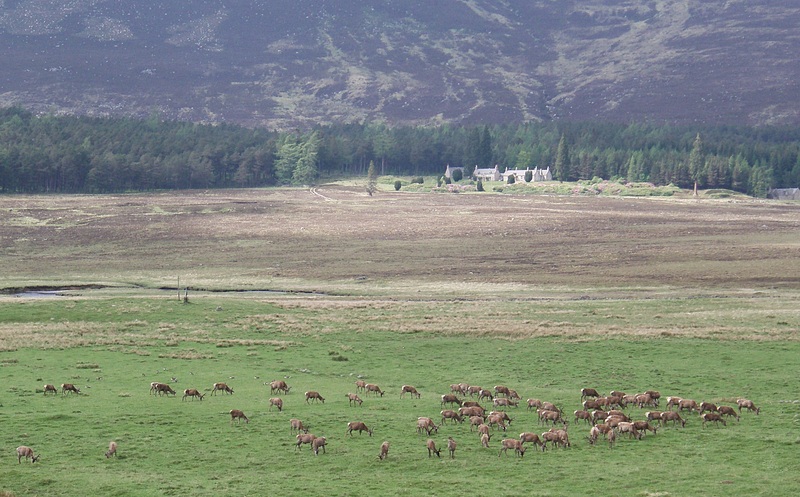 Creag a’ Ghlas-uillt. 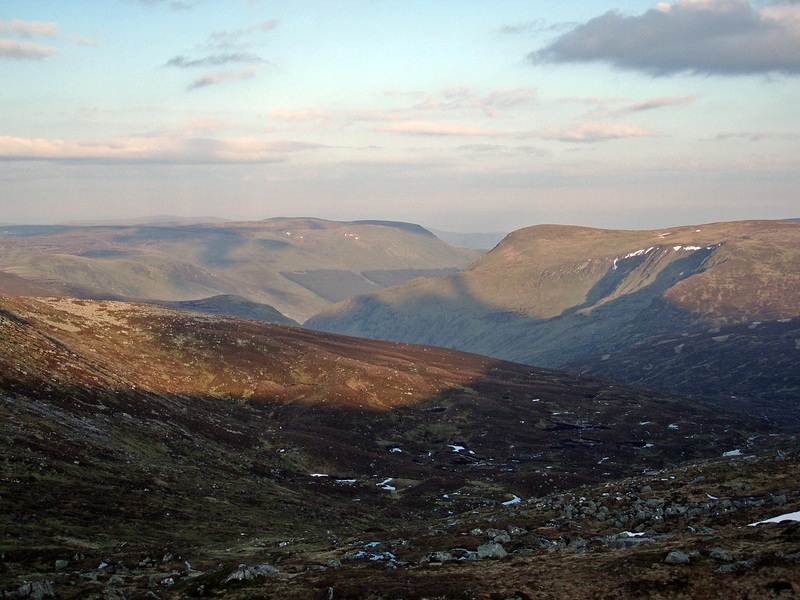 View towards Glen Clova from Creag a’ Ghlas-uillt. Eagles Rock. 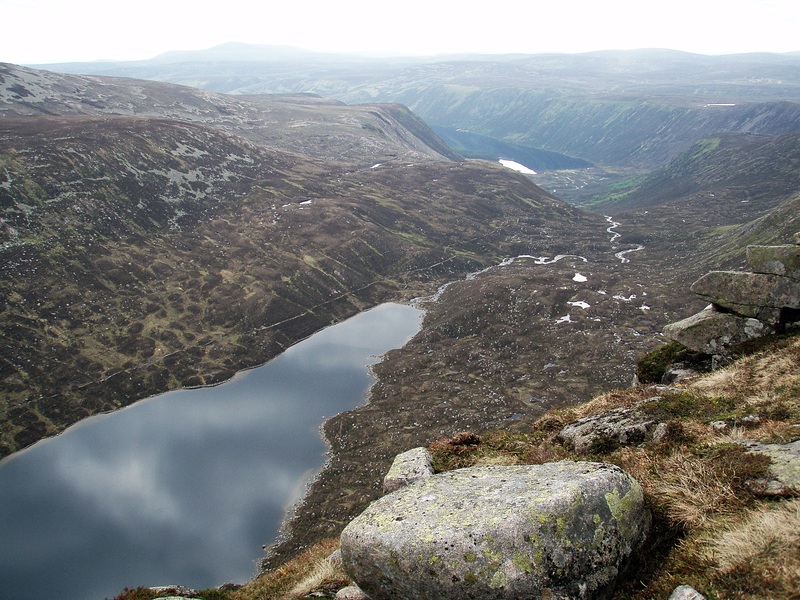 The cliffs of Creag an Dubh-loch, as seen from Eagles Rock. 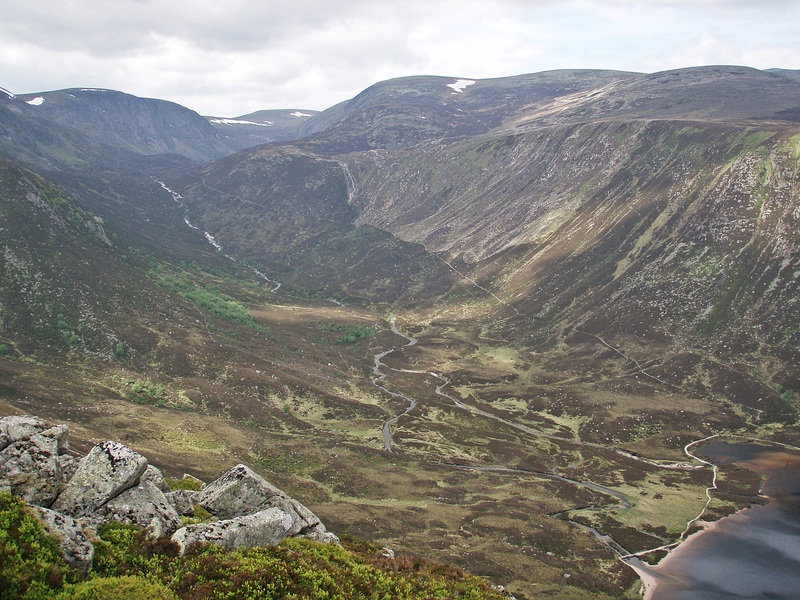 From Eagles Rock I contoured around Coire Boidheach, stopping by the Allt a’ Choire Bhoidheach to fill my water bottle. 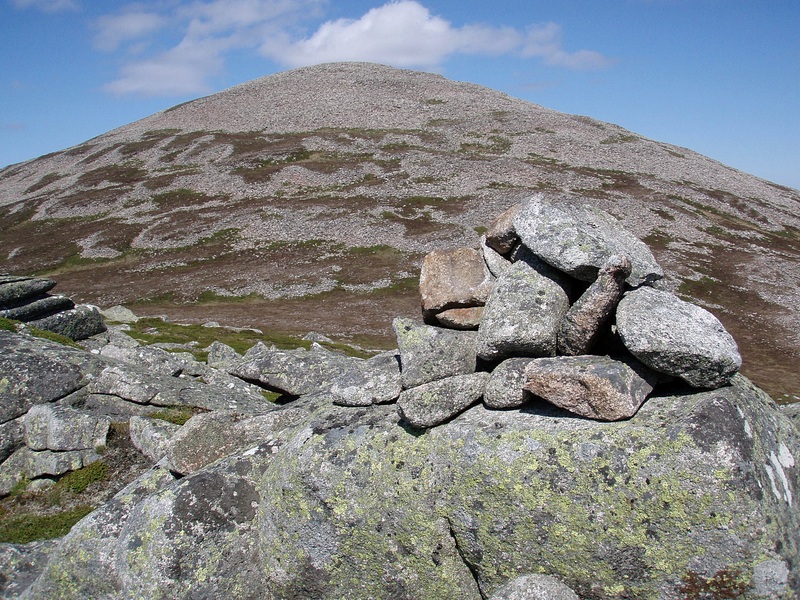 Carn a’ Choire Bhoidheach with The Stuic in the background. 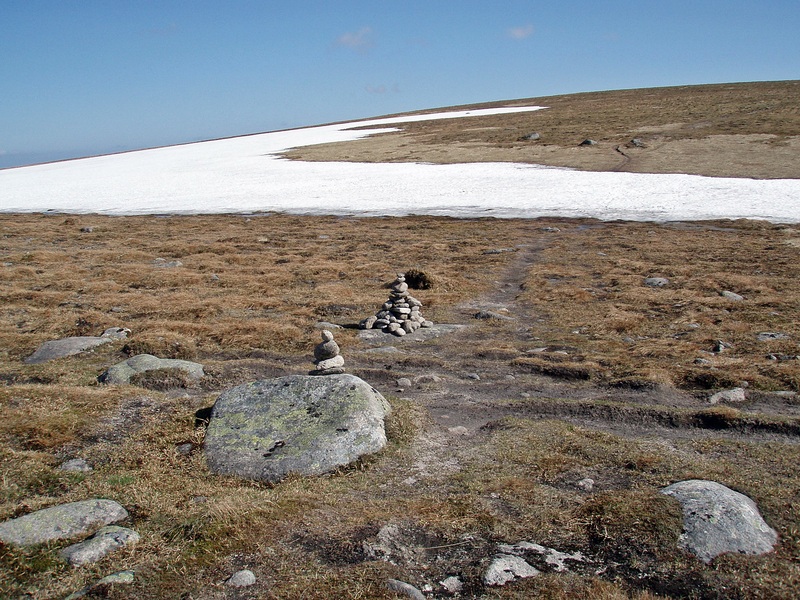 “Crossroads” between The Stuic and Carn a’ Choire Bhoidheach. 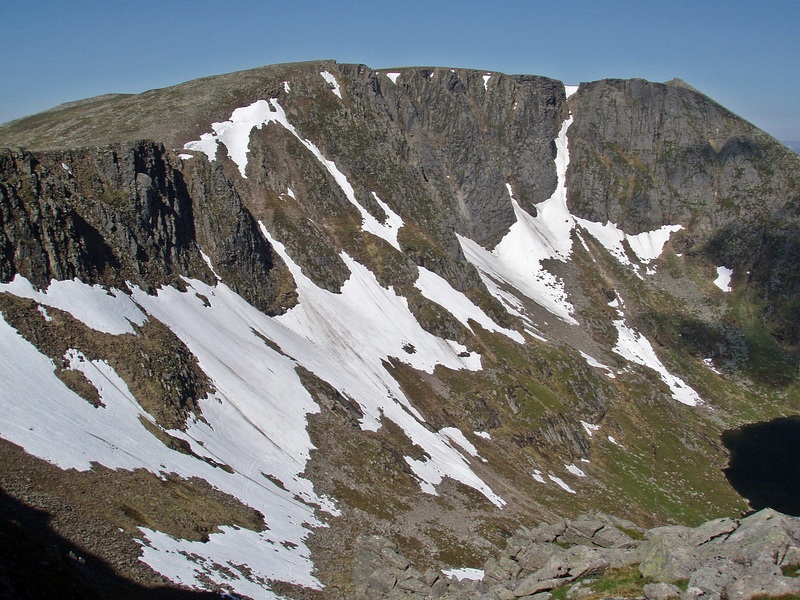 I walked over to The Stuic to have a look into Coire Lochan nan Eun with some impressive cornices along its edge. 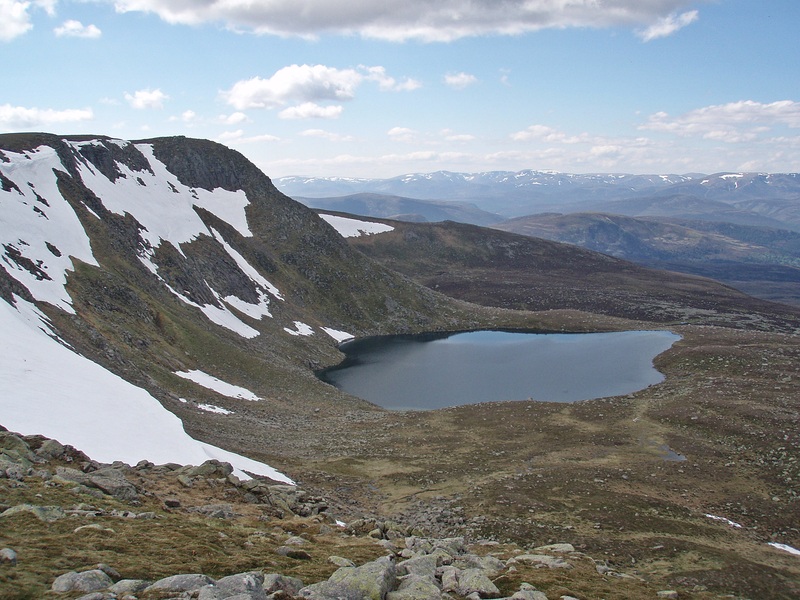 Loch nan Eun and Lochnagar. 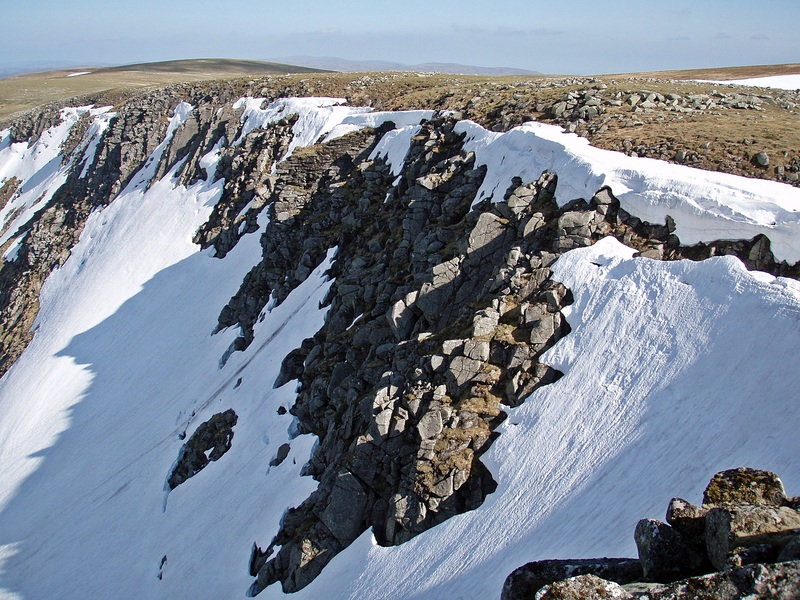 Cliffs above Loch nan Eun. 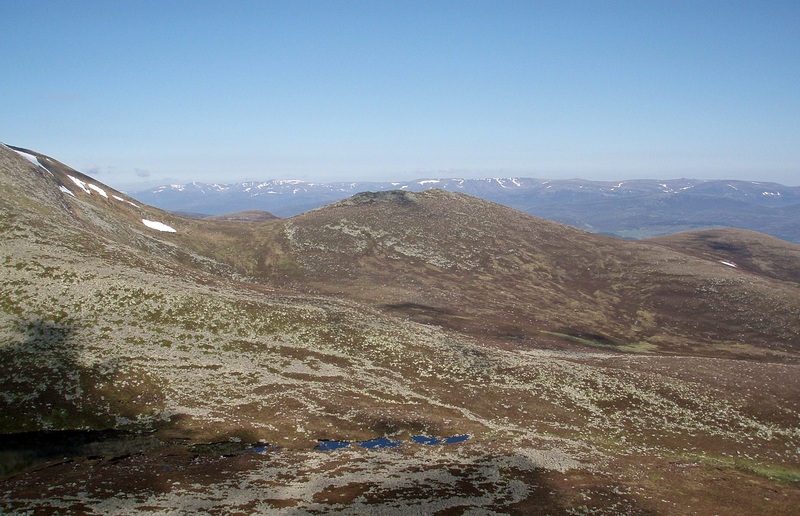 Looking back to Lochnagar. 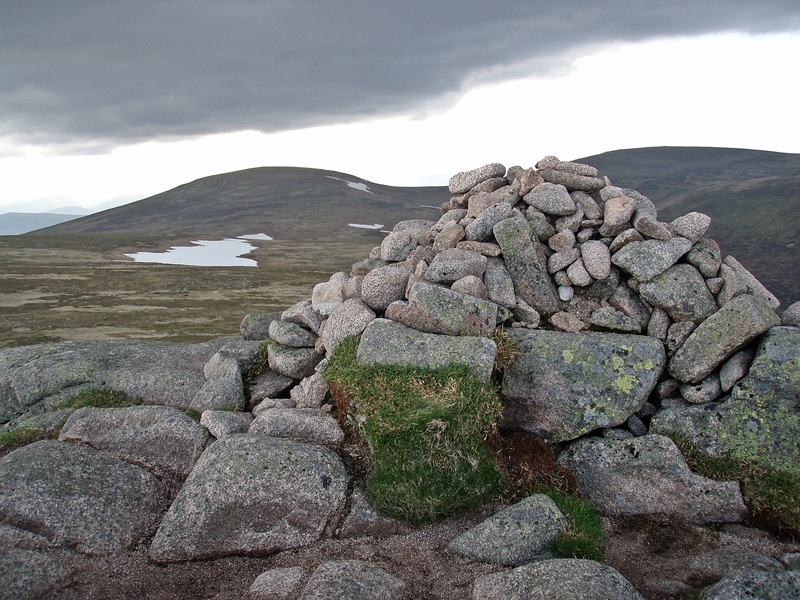 Broad Cairn, Creag an Dubh-loch and Cairn Bannoch. 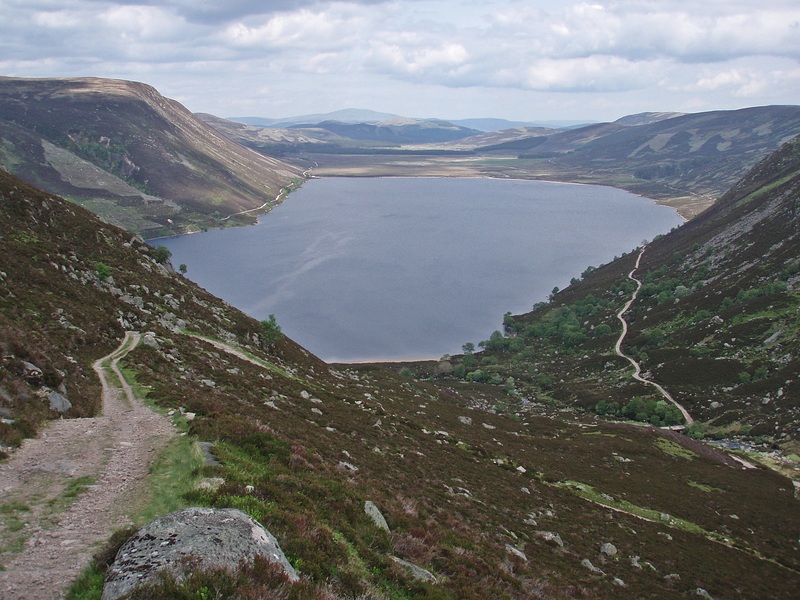 Creag an Dubh-loch. 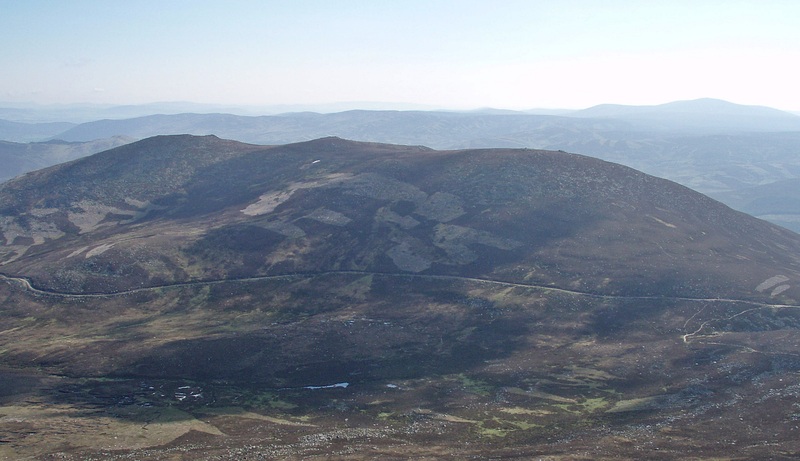 To ascend Carn an t-Sagairt Beag I used a path along a line of fence posts that I had spotted on my way down from The Stuic. When I woke up I wasn’t feeling well and I kept alternating between freezing and sweating. 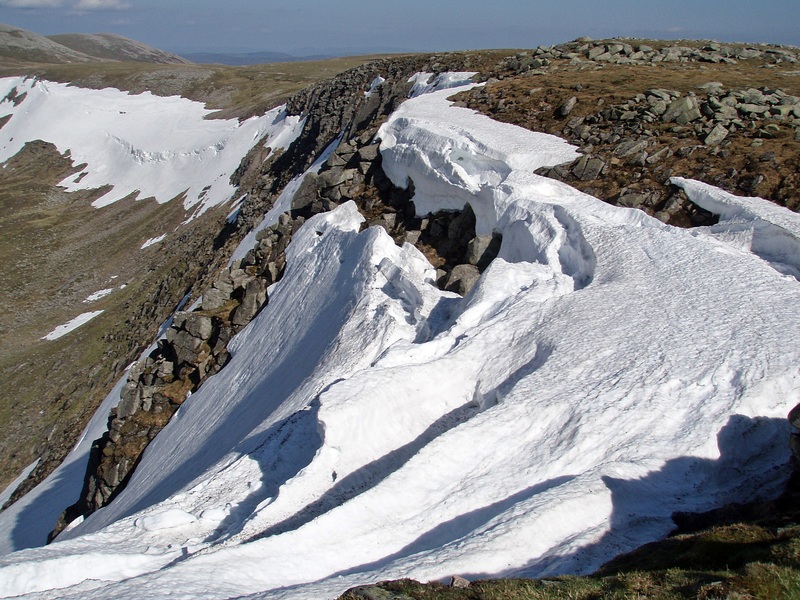 The cold that I had managed to suppress with medication during the TGO Challenge had finally caught up with me. 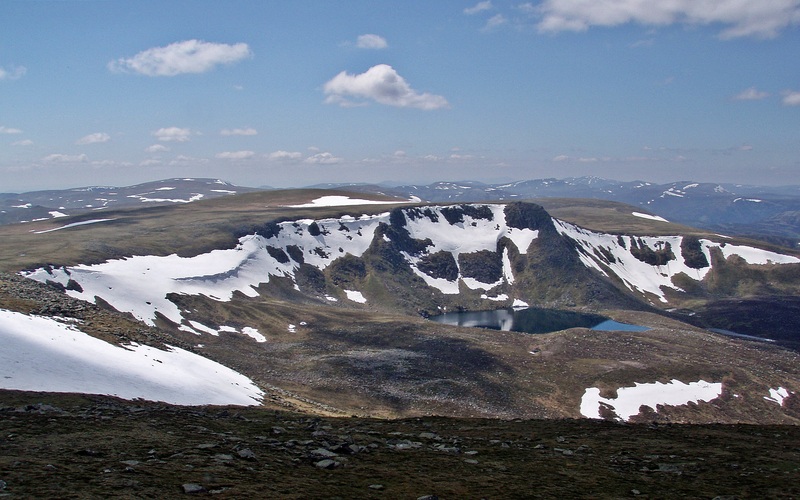 At least today I would only have a short and easy walk to do, and after packing up I climbed the short distance up to the bealach and over to Creag an Dubh-loch. 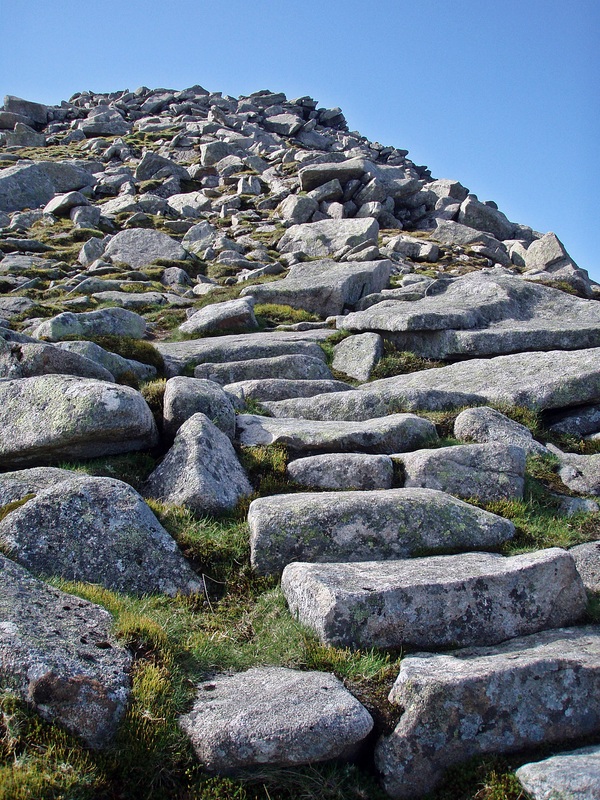 Carefully I walked a little further to have a look down the steep crags. 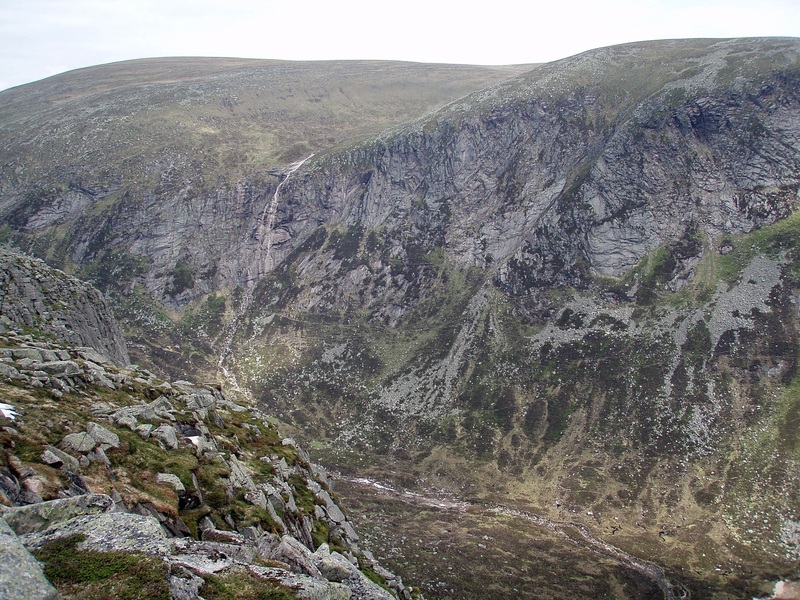 Waterfall on the Allt a’ Choire Bhoidheach. 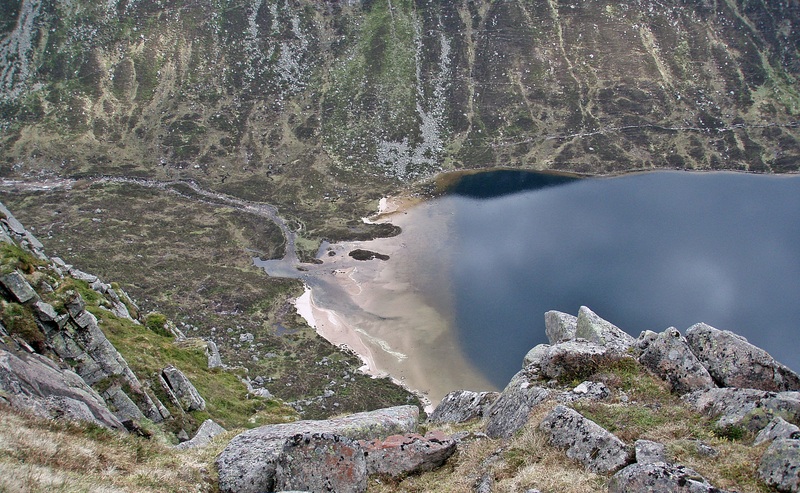 The W end of Dubh Loch. 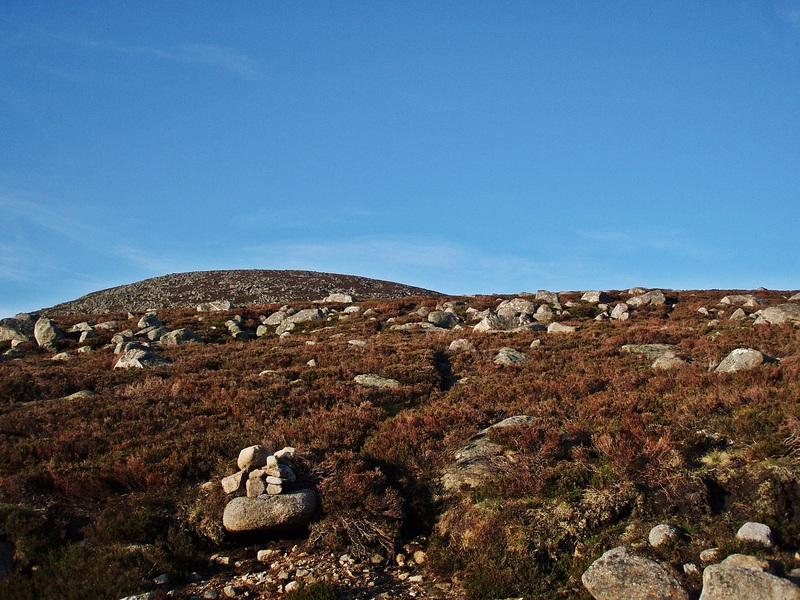 On my way towards Broad Cairn I was surprised to see three mountain bikers coming towards me across the boulder field. 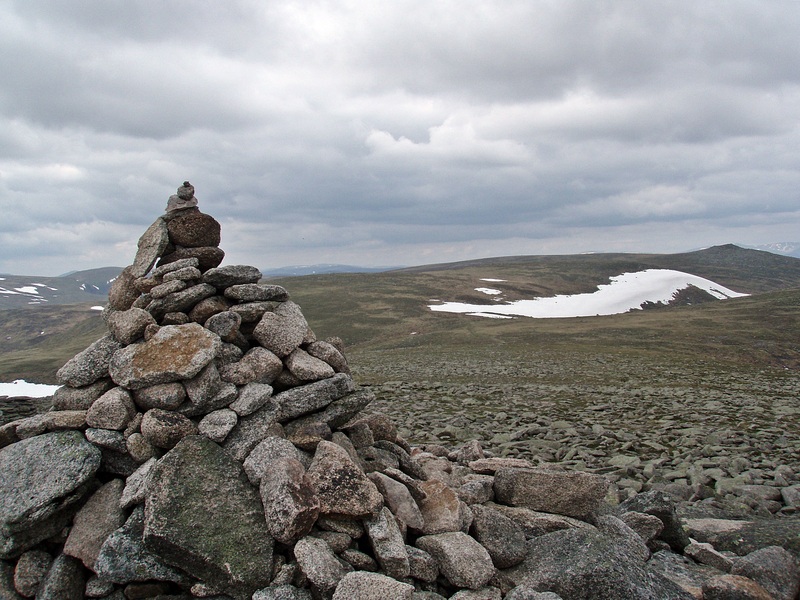 We had a brief chat and they said they were doing the whole Lochnagar round, descending to Glas-allt-Shiel at the end (which I found quite impressive). 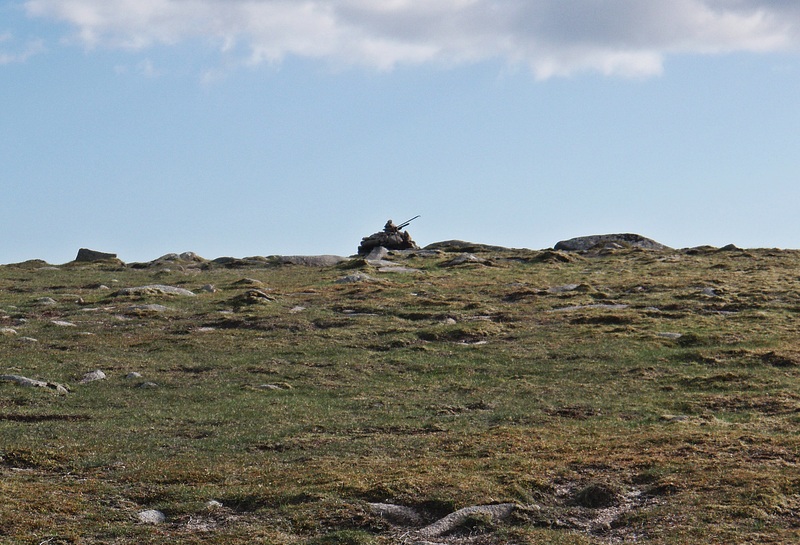 At the summit I met another walker and we also chatted for a while. 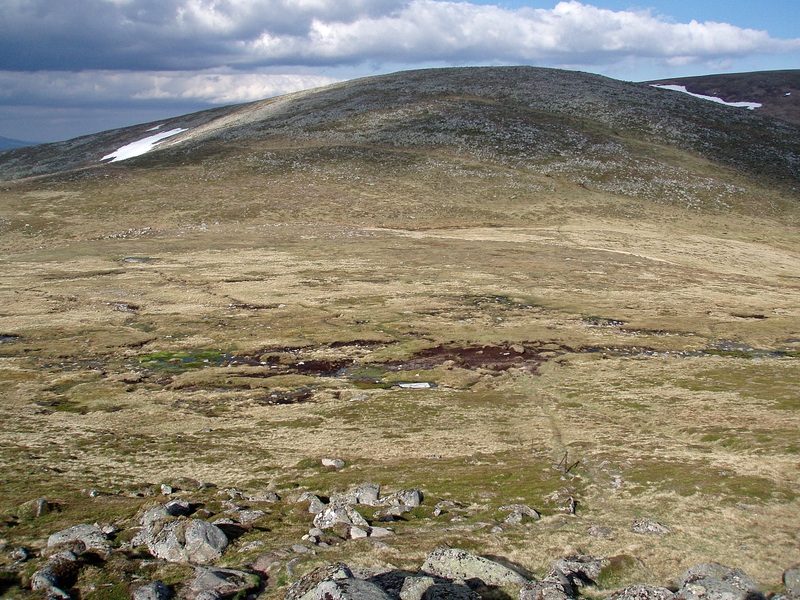 Then I continued first down the boulder field and then along the wide track to the pony hut. At the pony hut I stopped for a break and ten minutes later the place became very busy. 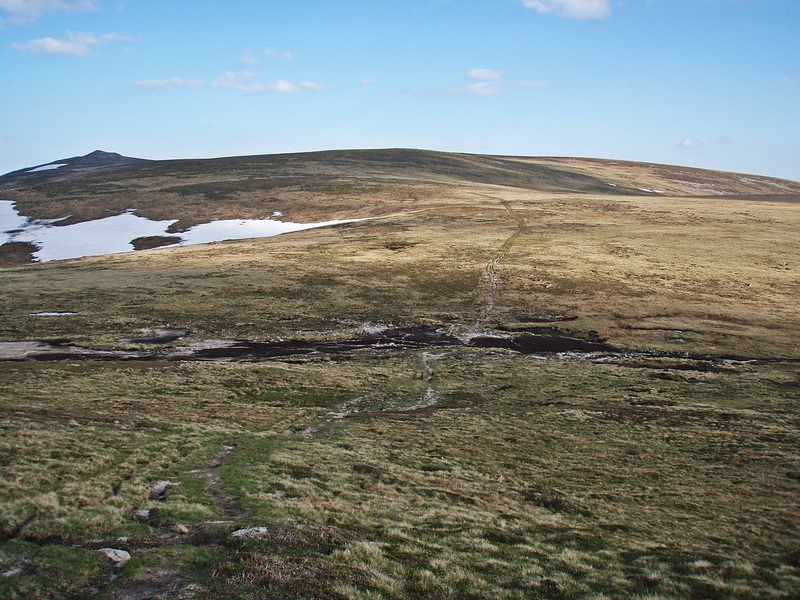 First I was joined by a solo walker, shortly afterwards another couple of mountain bikers arrived, then a hill runner and a group of about ten people and half a dozen dogs turned up, all spreading out around the hut. 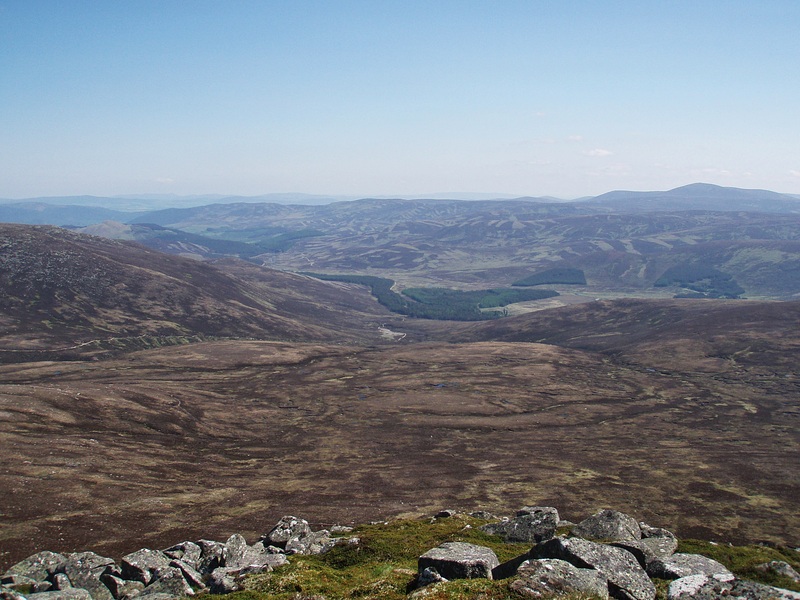 It was time to move on and I decided to walk along the track that runs high above the loch. 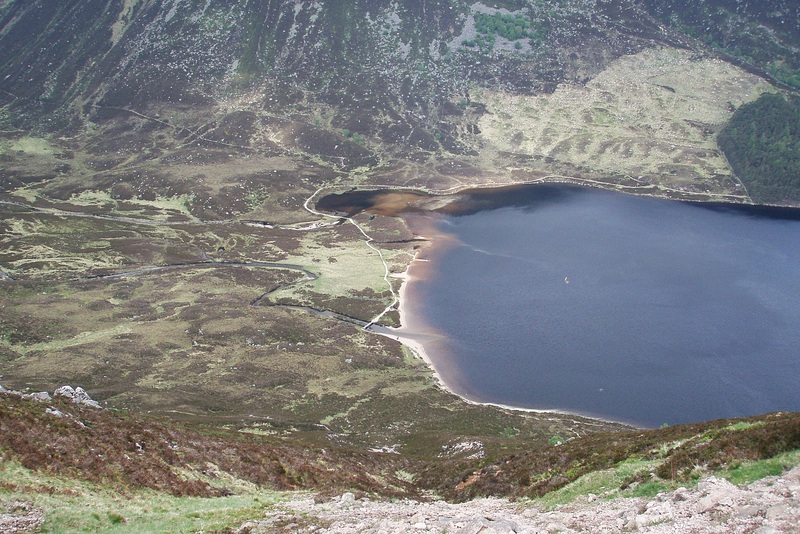 W end of Loch Muick. 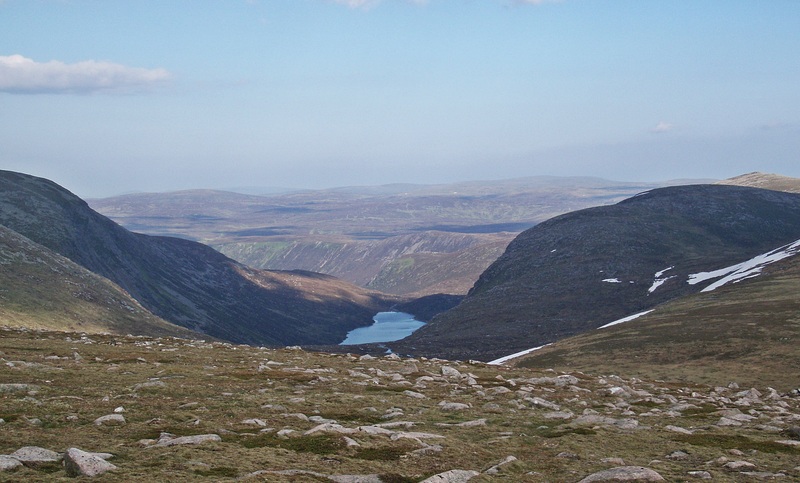 The track above Loch Muick. 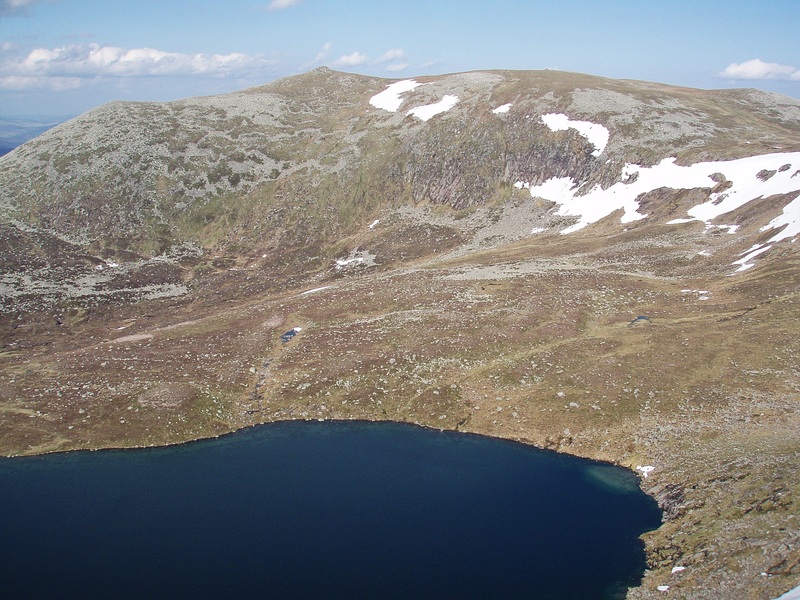 Corrie at the end of the loch with the Allt an Dubh-loch and the Stulan Burn. 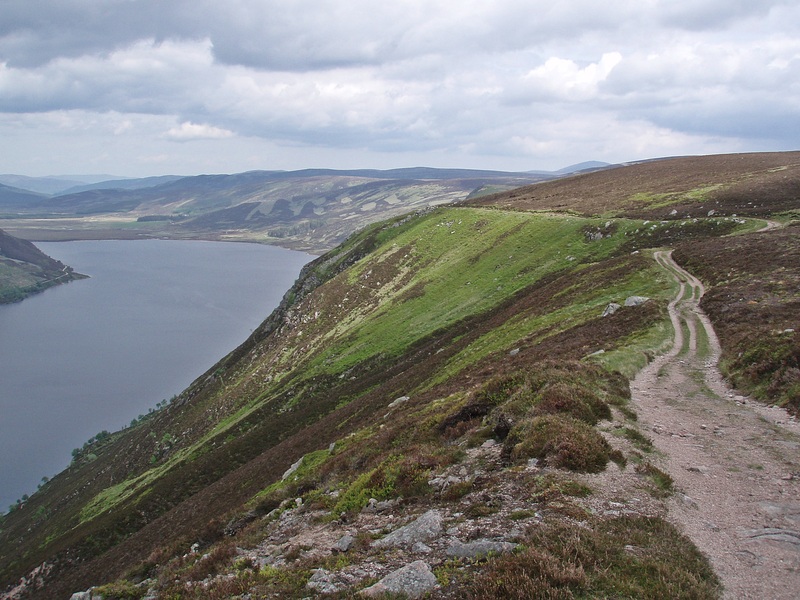 The track descends steeply to the Black Burn, crosses a bridge and then follows the bank of the loch. 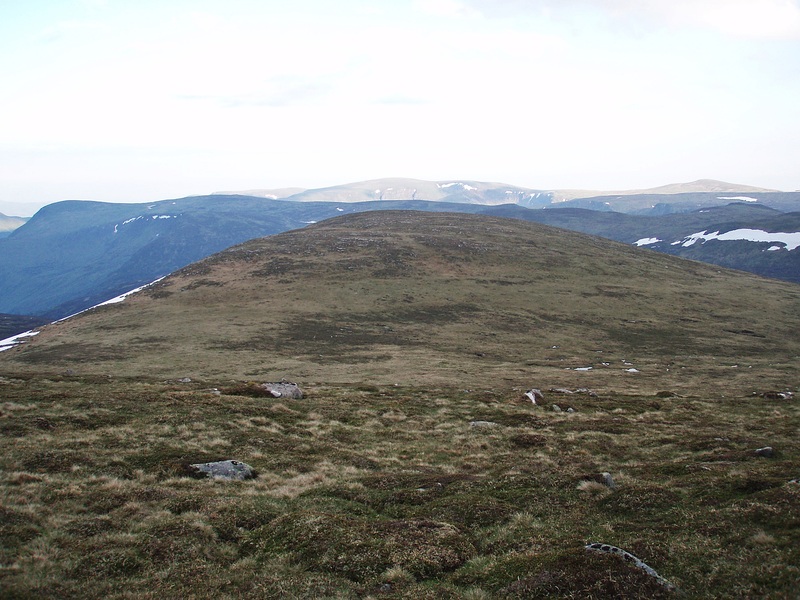 The last half hour I walked with a Belgian hillwalker living in Aberdeen, and with our interesting conversation on the way back to the car park the time passed very quickly. On the drive home I stopped at the tea room near Corgarff for coffee and cake which was a nice end to a successful and enjoyable trip. Superb area, great trip and wonderful photographs. 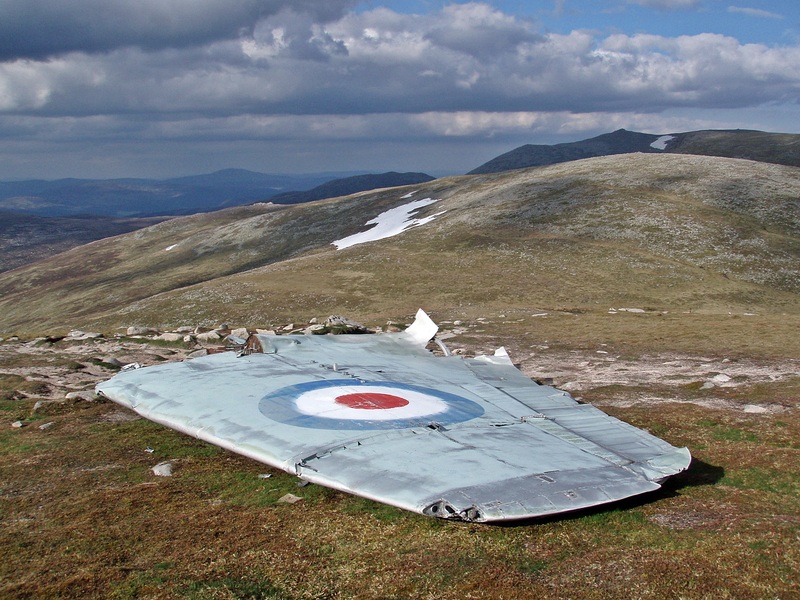 I ended up missing the northern top of Lochnagar – didn’t realise it was so easy – it looked like a big extra effort and I was trying to get all the others. 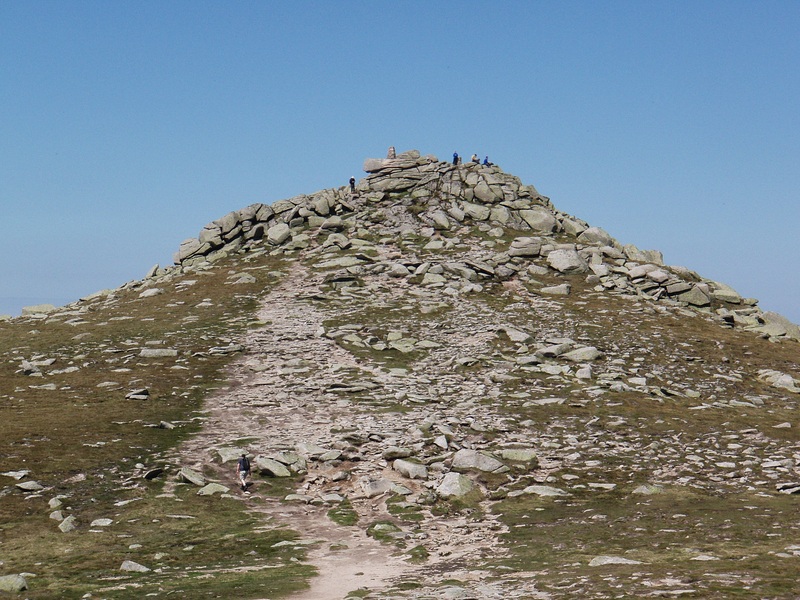 I too visited The Stuic – I was very surprised how many didn’t as it’s a superb viewpoint and no effort at all on the way to the second Munro! 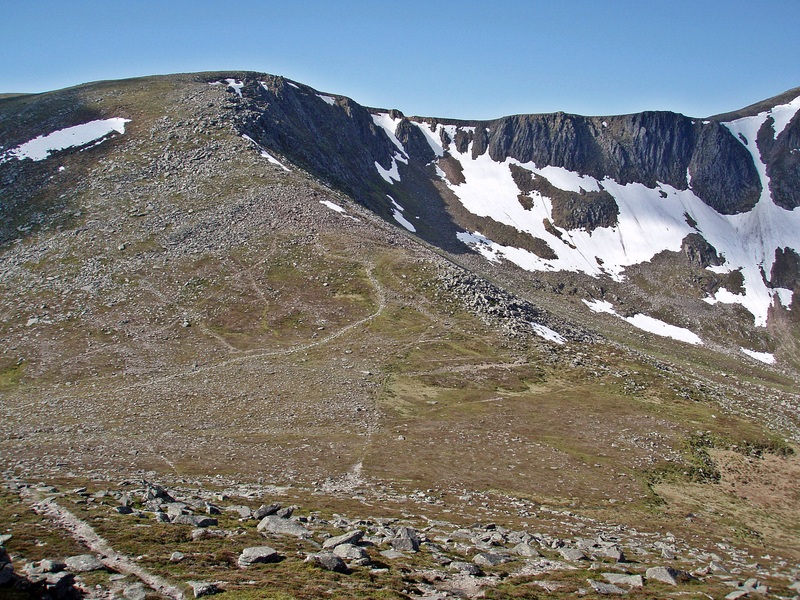 I ignored that path up the back of Lochnagar from Cuidhe Crom as it misses all the best bits – there’s a better one right around the edge of the spectacular corrie all the way. 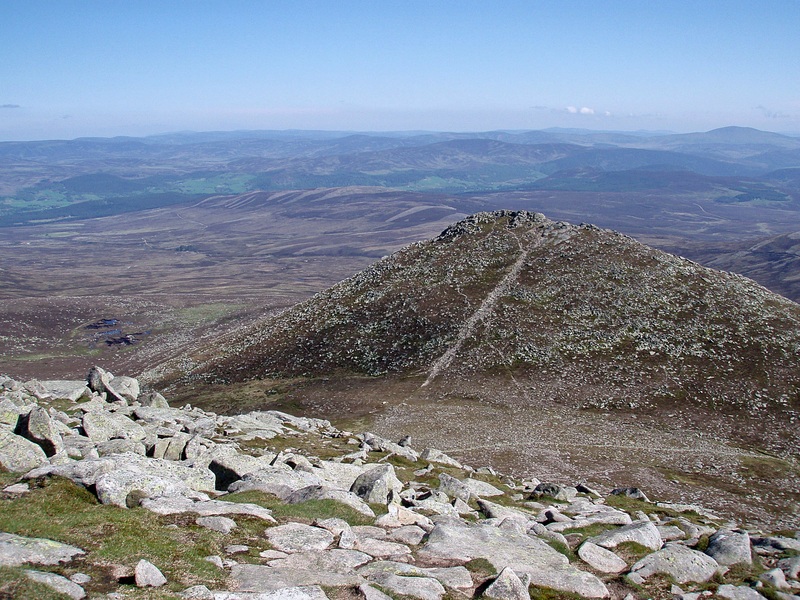 I don’t mind missing that top out anyway as my friend Richard wants to do Lochnagar and I’d like to try the Gelder Shiel approach next time and also do Conachraig. 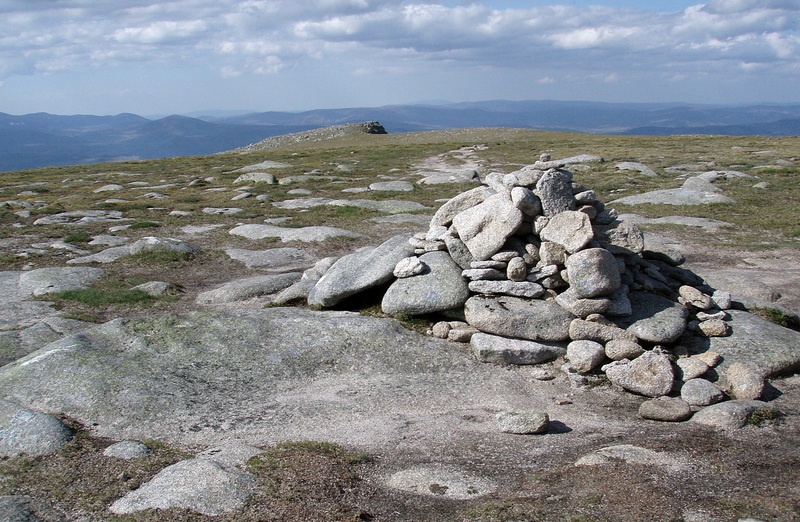 The Gelder Shiel route is one I would also like to try sometime, maybe on a TGO Challenge. 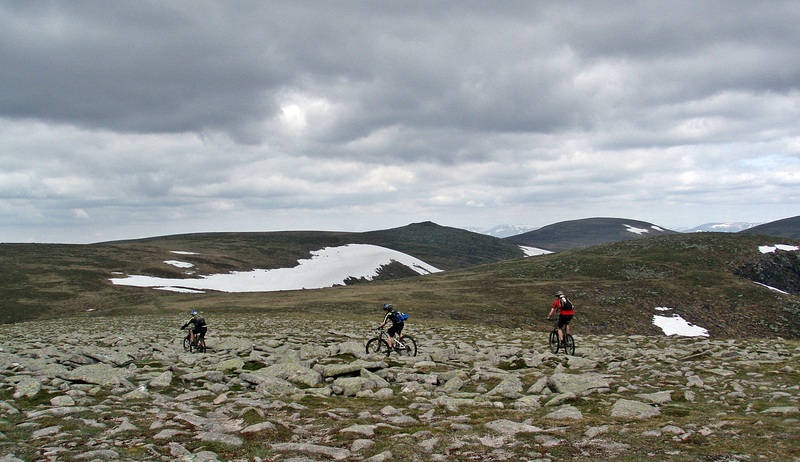 We don’t seem to get off-road motorcyclists much any more – we do get 4×4 drivers trying their luck though! 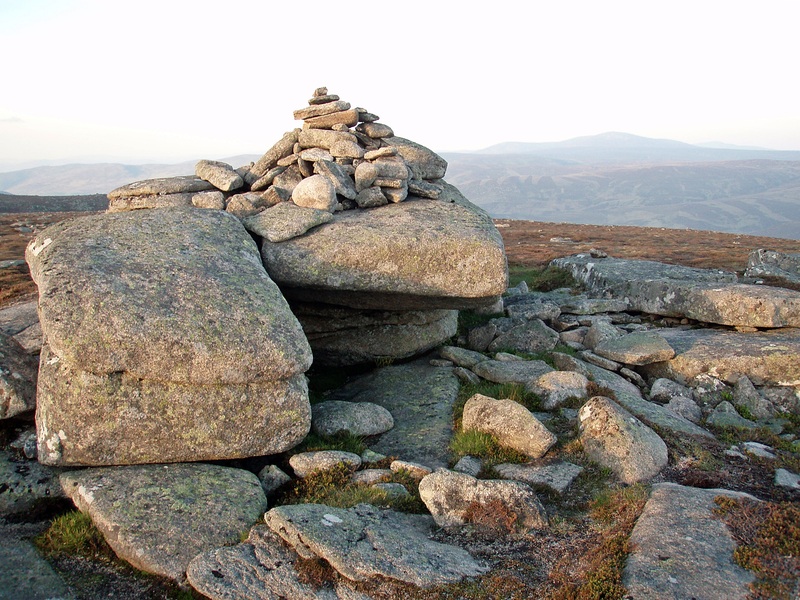 Oh yeah – and Little Pap is a nightmare of boulders isn’t it – luckily I finished off my walk over it and descended to Glas Allt Shiel afterwards. 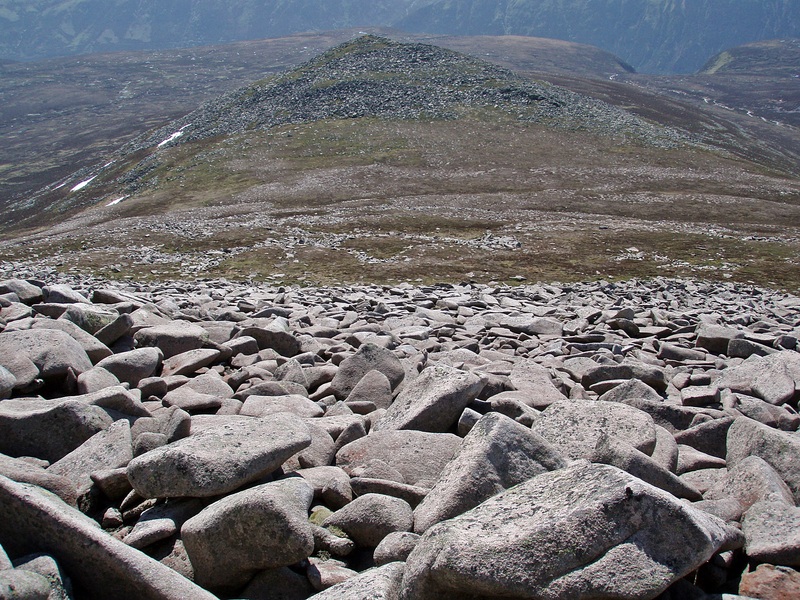 I wouldn’t fancy those boulders in both directions! 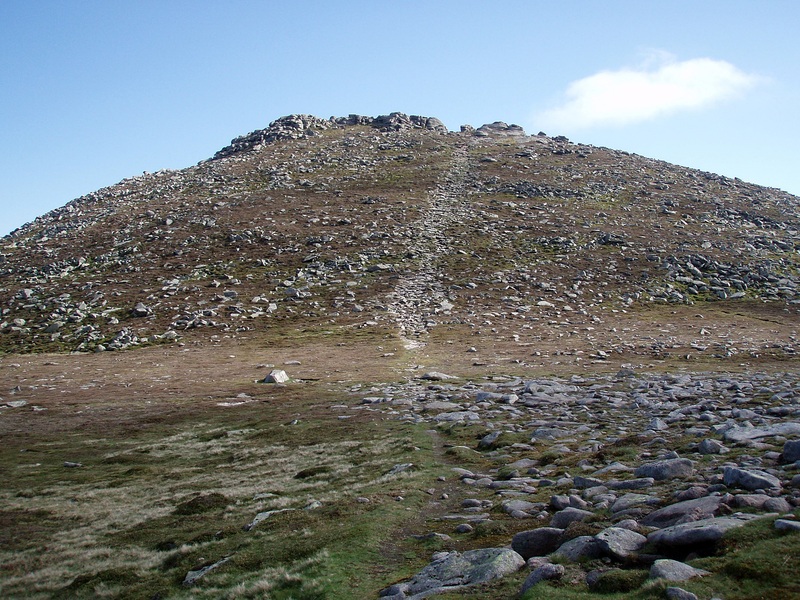 Yes, I didn’t exactly enjoy that one, but I found it easier and quicker to ascend the boulder field on the way back than to descend it!